Hiya. I'm about to switch off the computer for the rest of the day, after the morning check of comments and emails. Spend too much time with a screen in front of my face. Just popping in to say, here we go again. Another email has arrived from a production company researcher, they are making a programme about people who over spend and people who may be able to help them cut their spending to a reasonable level. They think I might be the person to do that. I probably am the right person, but at this early stage anything can happen. I was contacted a couple of months ago by another company for something similar. After a lengthy phone conversation an appointment was made for someone to come and interview me face to face. A day before this was due to happen I got the call saying they had to postpone it due to having business to attend to in the south, and they could not get here. I gave it a week and sent an email to remind them that I was still interested, and could they let me know when they wanted to visit. Never heard anything more from them, didn't expect to. What I think really happened was that they found someone else, and the 'busy in the south', was a polite let down. There is such a plethora of wannabe TV personalities out there, that they have lots to choose from, in the mean time they have to do the research and many hopefuls fall by the wayside. I have learnt to take these requests with a pinch of salt now, I have a laid back attitude, it might happen but then it might not. Mind you, I'm not sure I want to put my head on the chopping block again, look what happened to A Girl Called Jack. While it is great that she is earning a living from her blog, her article writing for newspapers, her radio and TV appearances, she has a lot to put up with. Endless targeting from trolls, bitchy people that keep dragging up snippets of her life from the past, chewing them up and spitting them out completely unrecognizable from the original story. You've got to be a tough cookie to put up with that. I know my stuff where frugal living and money saving is concerned. I could put people on the right road to becoming debt free and living within their means, but film production companies are making a product they need to sell. They need to be sure they have the right people to perfect the model, and that means following their script. I can't learn lines so my acting is ad lib, it's whatever comes out at the time. As you know I like to put a slant on things which detracts from the straight and narrow. I like to filter out some of the serious parts of life and turn them around to breath fresh air into an otherwise humdrum existence. I spread the word that life isn't too bad, if you strive to get a grip on things. Sinking is not an option with me, I will paddle like mad, even though I can't swim, ha ha. I don't know if I fit the mould of what they are looking for. I'll maybe find out when we speak, that's if they decide to contact me again. Right, lunchtime, have a nice weekend. Bit cold here, overcast, I'm hungry. Howdy pardners. 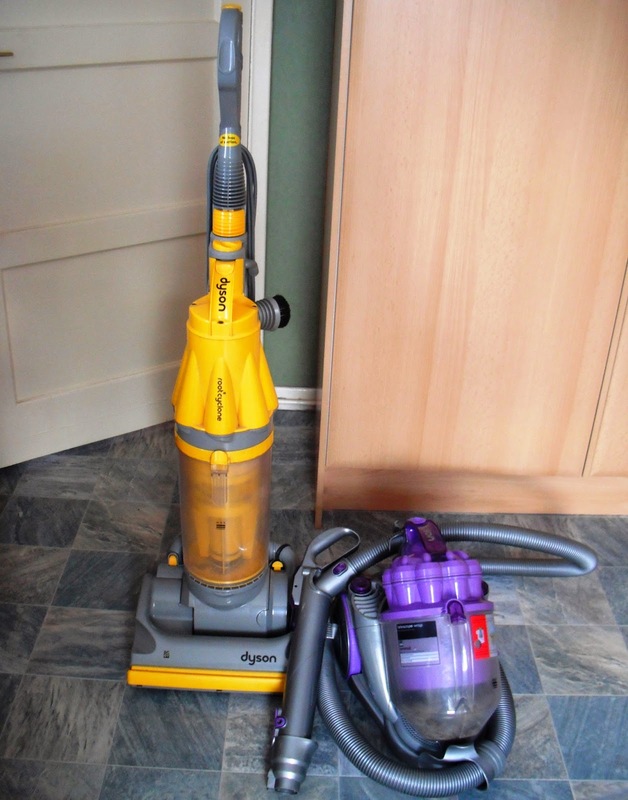 I am now a two Dyson household. You may remember I got the purple machine out of a skip last year, didn't expect it to work but when I plugged it in, it sprung to life. Amazing. It was pretty filthy though. It's been in the shed out the back awaiting a good clean and today was the day. It was sunny so I had it outside on the table and gave it a good going over. I did think about giving it away, but now I will keep it because it will make the job of cleaning the stairs a lot easier. That cumbersome yellow upright thingy is a bugger to balance half way up the stairs. I have to steady it by wedging it between my legs as I get the nozzle into the corners. The dinky little purple one will be much more suited to that job. Only trouble is that there are no attachments with it. I tried a flat nozzle from the other one thinking they might be interchangeable, but it didn't quite fit. Then I remembered I had an old nozzle from a previous machine and went searching for it. Eventually it dawned on me that I had probably thrown it out. 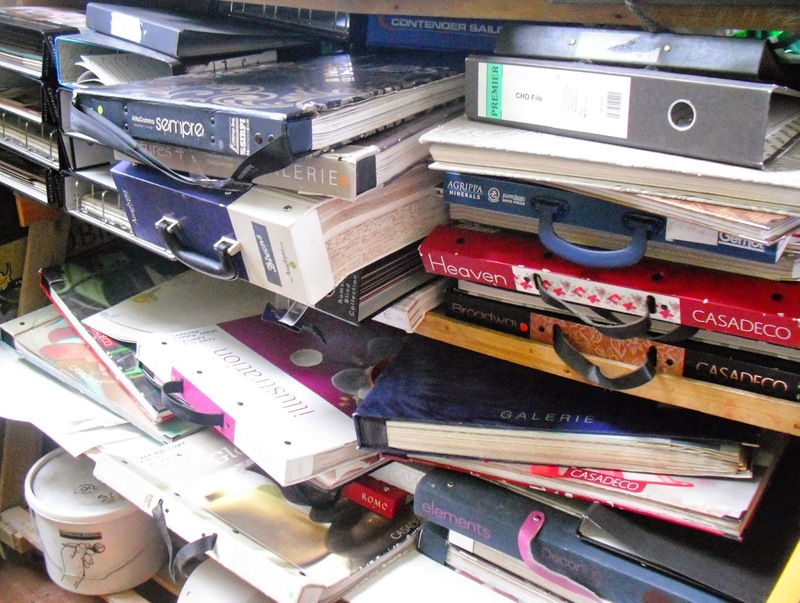 Typical, I tidy up, dumping stuff I don't want, then ages later I need it. I did find a plastic pipe though from a very old machine, and the flat nozzle fitted the end of it. As the pipe was tapered, it was a matter of sawing six inches off the narrow end which meant that it fitted into the sucking bit of the purple one. I don't know if you can understand that, but briefly I found a piece of plastic pipe which joins the two pieces together. Success. Now I have one for upstairs and one for downstairs, and no lugging that awkward upright about. I found another door yesterday for my project. There has been a skip on someone's driveway for about a week, nothing exciting in it, just building rubble. Yesterday I noticed a door had been put on the top, but there was no one in the house to ask. I stood chatting to another dog walker for five minutes, when a car pulled into the driveway, that was lucky. The lady said I could have the door so I went round in my car and picked it up. It's in very good condition, perfect in fact. Heidi's scabby face wasn't getting any better so I took her to the vet today. We have a nice lady vet who comes twice a week to the next village. She comes from a big practice a few miles away and uses a little empty terraced house as a makeshift surgery. She is very popular, you don't make an appointment, just turn up and wait in line, and she stays till everyone has been seen. She doesn't think the injuries are from a fight, and I am tending to agree with her now. If it was a fight it should have healed by now. Marion took a sample of scabby fur and will analyze it, she thinks it is some sort of allergic reaction, so Heidi had a shot of antibiotics and I have some lotion to put on. Poor Heidi, she was very calm while on the table, and didn't mind the car journey too much. Is it the weekend again already, where does the time go. Enjoy yourself whatever you are doing. Hello. I had a nice day with a nice friend today. 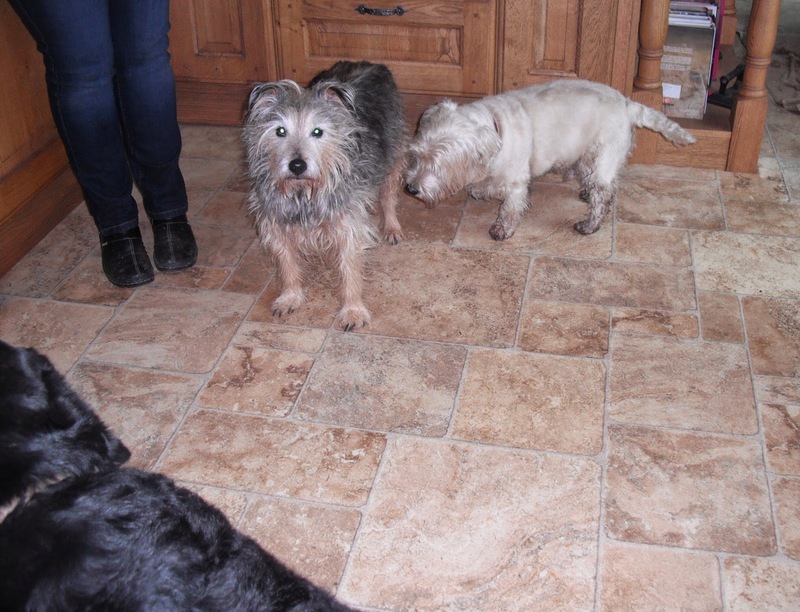 Lady Helen, pack leader, invited me to her house for a catchup chinwag, some dog walking, and a sewing lesson. It was raining first thing so it was a good idea to sit in her kitchen having a good old gossip over a mug of coffee. Helen only has one dog, Henry choc lab, you've seen him before. Ten minutes after I arrived friend Roy dropped his two dogs off while he went to town. 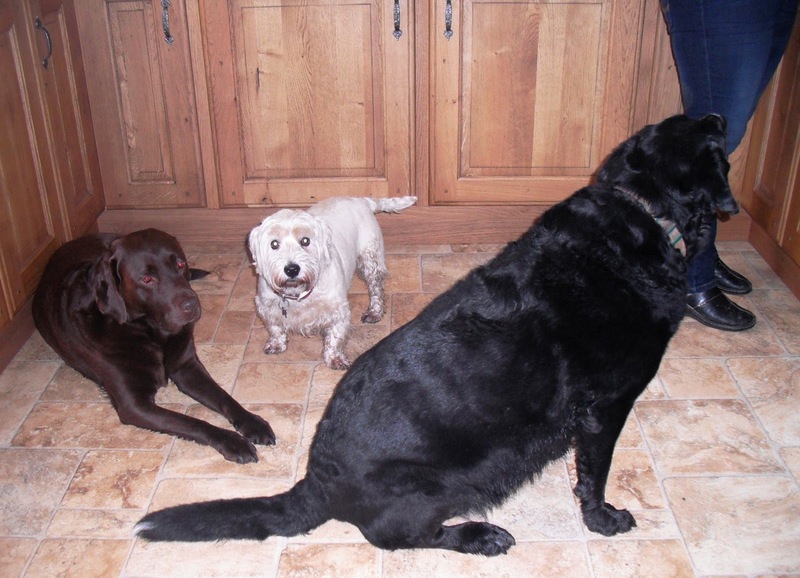 Angus is the white Westie, and Guinness the black lab. The rain eased off so we took them out for a walk. Rocky had to stay behind because he would have been too slow to walk the distance we had planned. I had already taken him out earlier so he was happy to snuggle up on the mat next to the radiator. When we got back it was lunch time. 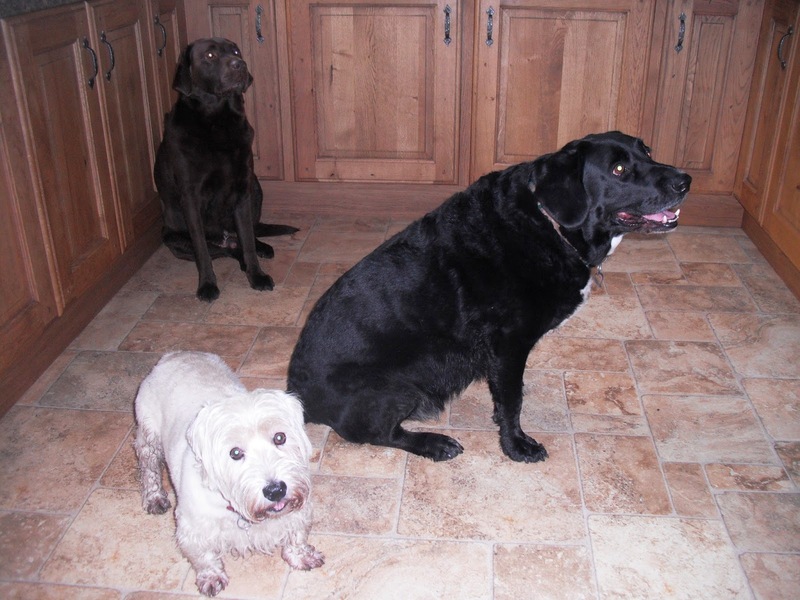 Here we have the three dogs waiting patiently for Helen pack leader to offer some tasty morsels. Food all eaten and plates cleared away, the sewing machine was put in position on the table. Helen is thinking about buying her own machine and taking up sewing as a hobby, so I took mine to show her the basics. 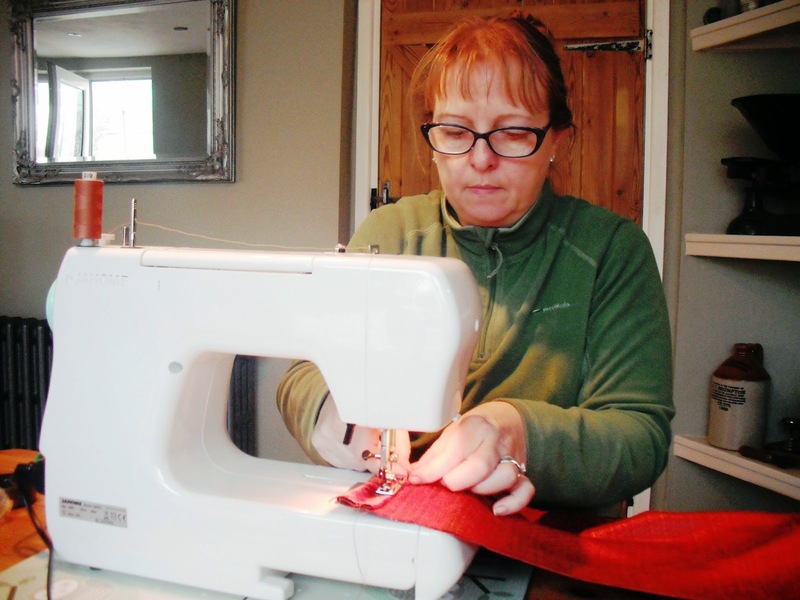 Last year she tried a sewing class, but the teacher didn't take into account that Helen last used a machine at school, and couldn't remember much about it. Getting her to put a zip in on a first lesson was not a good idea. 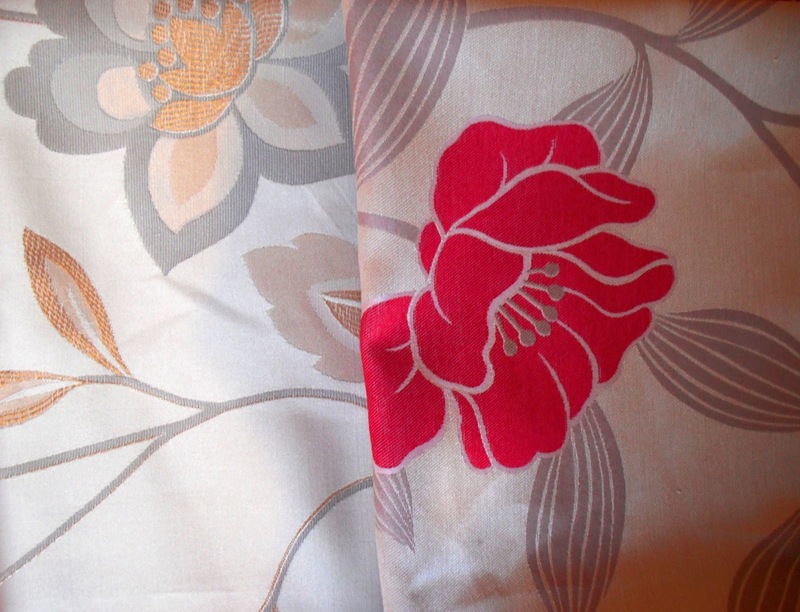 Today we made a simple envelope style cushion cover, and an easy to make shopping bag. Here she is, concentrating on getting the seam right. Her straight line sewing is perfect, she just needs practice, and to learn a few more techniques. On the way home I pass three shops, a small Tesco, the Co op, and a Spar shop. I called in all three in the hunt for reductions. A few bargains found their way into my shopping bag. Mushrooms, black grapes and green grapes, cucumber, potatoes, cheddar slices, yogurt, stir fry veg, broccoli and cauliflower florets, and macaroni cheese. 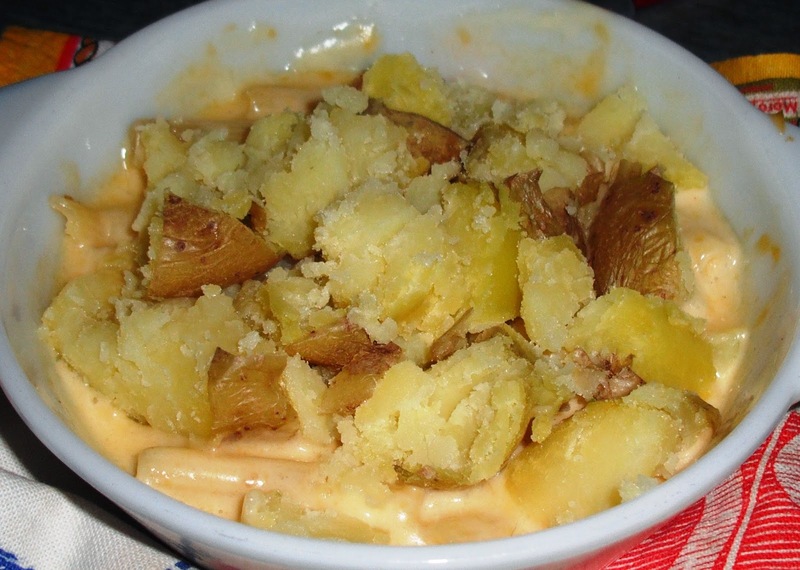 My dinner tonight was half the macaroni cheese with a little extra grated cheese on top, a potato in the microwave, cut it up and add the two together. It is definitely lacking in colour, but not in flavour. 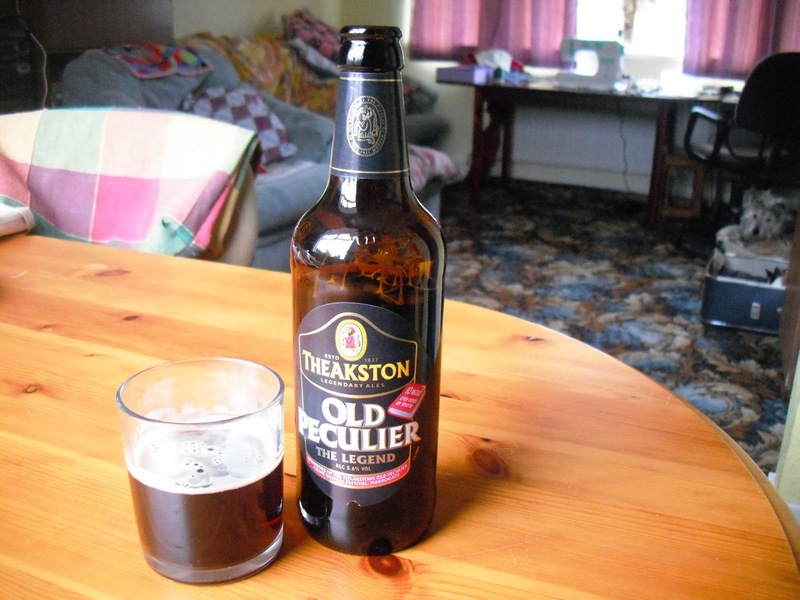 Very tasty, cost, 70p. A very enjoyable day, relaxing, chatting, laughing, and putting the world to rights, with a good friend. Thank you for your comments yesterday, I really appreciate it. Tatty bye and Toodle pip. What can I sell you? Hello. I will have a picture free post today. Not that it matters how many pictures I post, I pay Google the exorbitant fee of £4 per year which gives me way above the permitted capacity to store them. The book is all about how to grow a business through the internet, using Facebook, Twitter, Google, Youtube, Instagram, Pinterest, and more. The man is so good at following his own advice his book is up there with the Amazon best sellers. Clever chap, writing about how to use social media to market your business, then adopting the strategy of, 'do as I say', and reaping the rewards. I've come to the conclusion that this is where I am falling down at the first hurdle. I don't preach the, 'do as I say', method, I am more like a 'this is what I do, you can please yourself,' sort of girl. Maybe I ought to be thinking about writing a self help book myself, incorporating all my common sense ideas and logical thinking. Several flaws with that, I can't be bothered, I don't want a job, and I don't need the money. But what I can do is peddle my wares here in a fun, tongue in cheek way, dishing out what I see as the bleedin obvious, while drawing on my many experiences at the University of Life. If you want to take advantage of joining my 'tell it like it is' course, here is an opening offer which you might like to consider. No monetary recompense is required, it is free for the taking. The only investment you will need to make is a large deposit of your time, depending on how long you want to stay on the course. A good starting point would be to click on the 'Reflections on Life' button on the side bar and re read the posts in this section. It will familiarize you with my style, and will give you some alternative ideas that you may not have thought of.. If you have already read these, a quick skim over will suffice. So, to join my course you need to invest some time. How much is entirely up to you. As with anything in life, the more time you give to something the better you get at it. Common sense really. 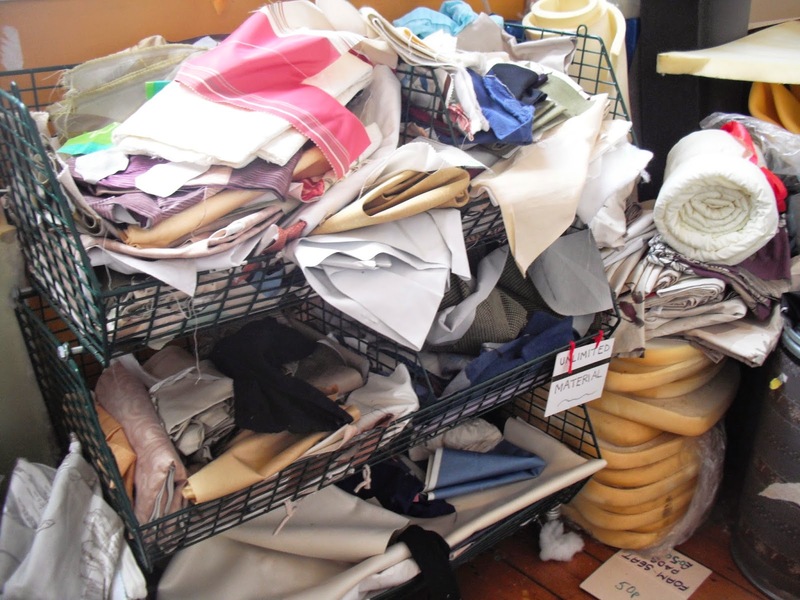 If you want to improve your sewing and cooking skills, practice, practice, practice. If your aim is to get rid of the dead wood, you need to start pruning, so why not do it now. Over the years I have had a lot of people saying to me, 'Ooooh, I wish I could do that'. My reply, 'You could do if you really wanted to'. This is then followed by the excuses, why they couldn't possibly do it. I say to them, don't wish your life away, don't ever wish you were someone else, or somewhere else. What I do, I do it for myself, you could do the same. You are in the here and now, life doesn't stand still, time is running out. That's common sense to me. I am often called an inspiration, I feel quite chuffed about that, but I don't want you to read about my life then feel a bit miserable because you think you are missing out on something. That's not the aim. You don't have to be like me, you don't have to follow my example, all you have to do is take control of your own life and steer it in the direction you want to go. I really really want you to do that, will you make a start today? If you are happy most of the time, that's great, if you are happy all of the time, that's brilliant, you are where you want to be. I suggest you keep a happy diary, note down the times when you are happy, and the times where you are not. Is it a good balance? We all have to do things we don't want to, that's life, but to repeatedly do the things we really don't want to do, that's daft. I don't repeatedly get my Dyson out, and do the dusting, because I get no pleasure from it at all, but I do get pleasure out of getting the best food bargains, it's a challenge, it's fun to try and beat the system, and to keep on top of the game. All through my life I have been able to move on, don't like my job, get another one. don't like the boyfriend, get another one. Resistance to change can lead you up a dead end. I don't want to be in a dead end, I want a way out, and that is down to me, no one else. The only dead end I expect to be in is when I am on my death bed, hopefully by that time I will have done all I want to do, and going through the door will be a happy occasion. Love the words of this song. Are you with me on this? If it aint broke you don't need to fix it, but if your engine is a coughing and a spluttering and about to conk out, why not give yourself a full service. You can do it. Thanks for reading, and best wishes. That's not scrap, it's useful ! Hello. 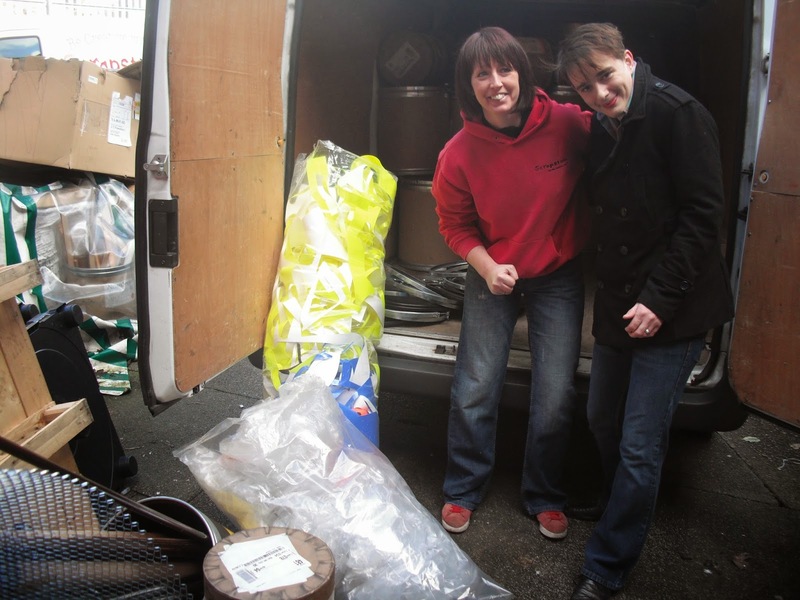 This morning four of us went to Hull Scrapstore, Janet, Ali, Linda, and me. I provide the wheels they pay £1 each for the Bridge toll, good arrangement. 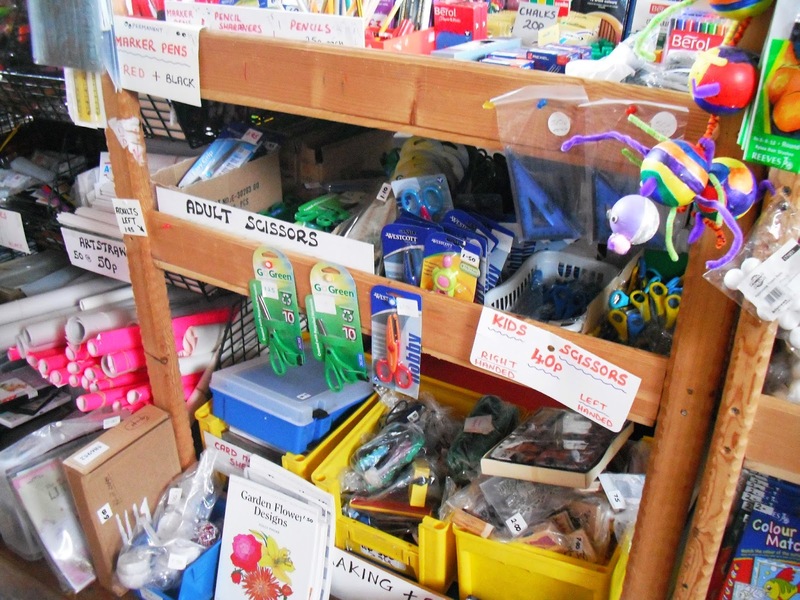 It's housed in an old school, plenty of room, lots of stuff to rummage through. 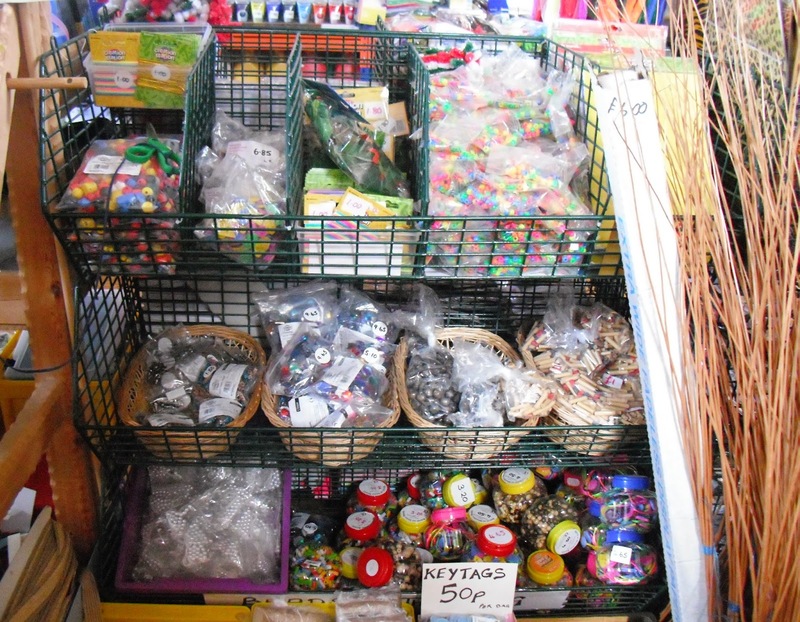 Fill a basket for £5, if you pick anything with a price on it, that's extra. 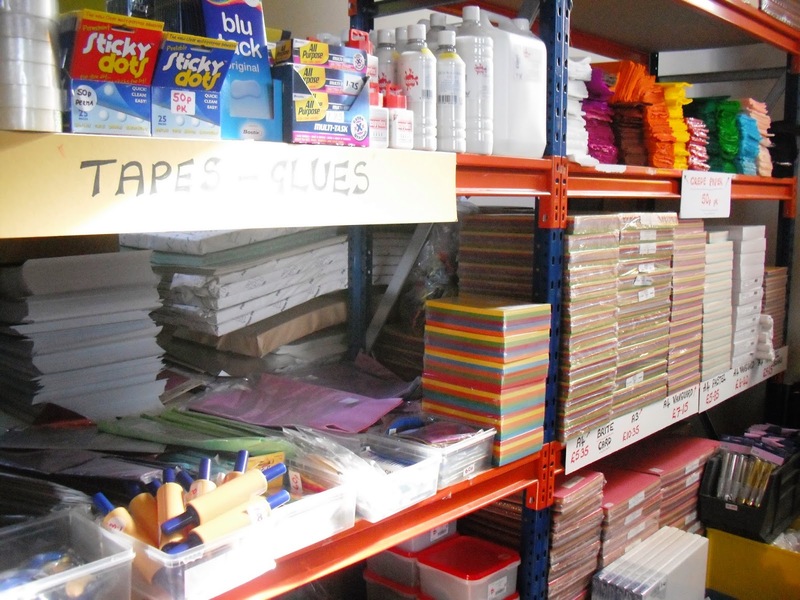 Lots of photo's for you to peruse if you haven't been to a Scrapstore before. 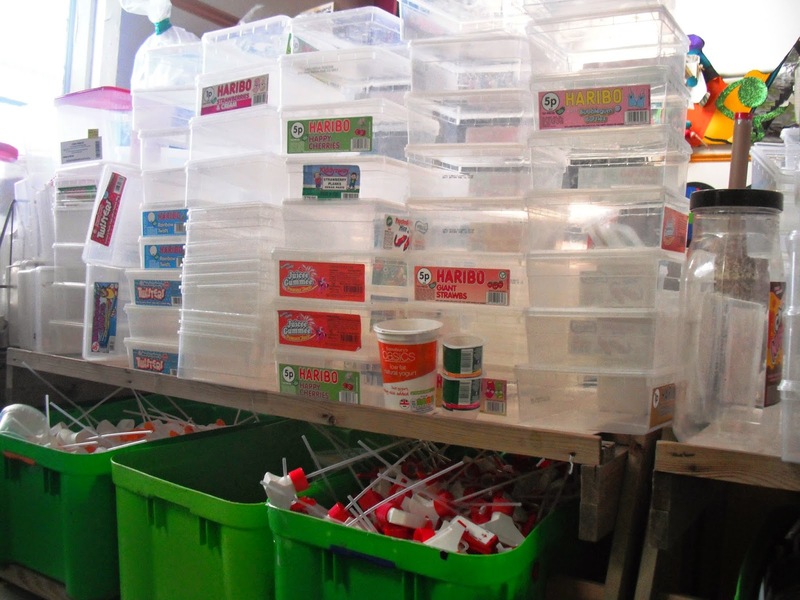 Everything has been donated by businesses, manufacturing, office, and retail. 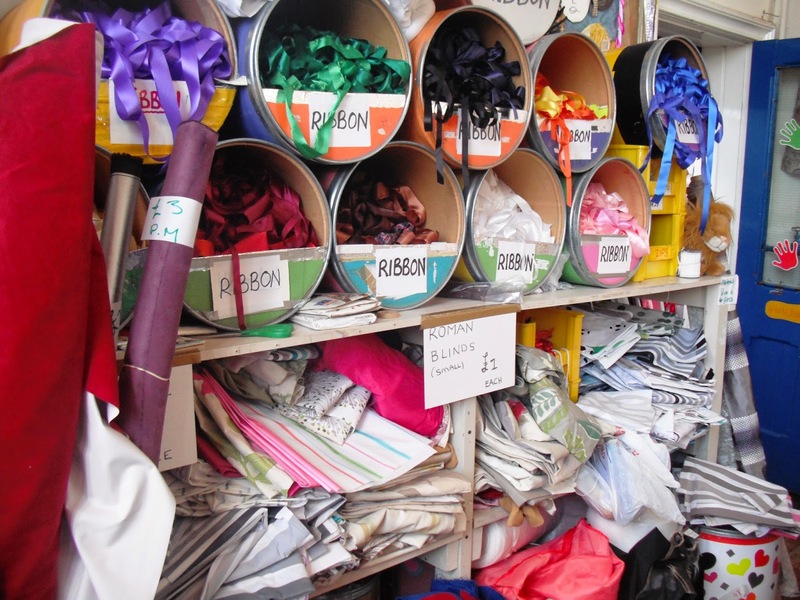 Items are end of line, offcuts, mistakes in the manufacturing process, overstocking, end of season items, and moving premises or closing down. 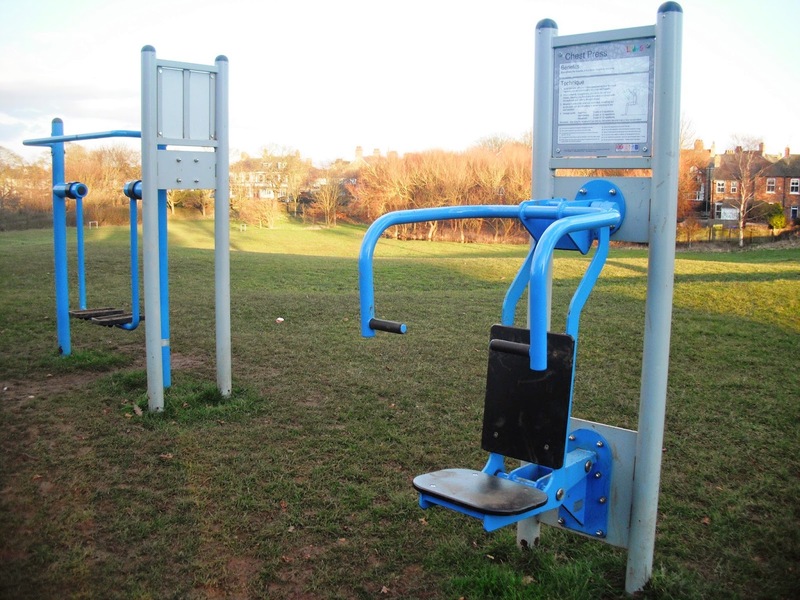 Here we have coloured sticky back plastic. 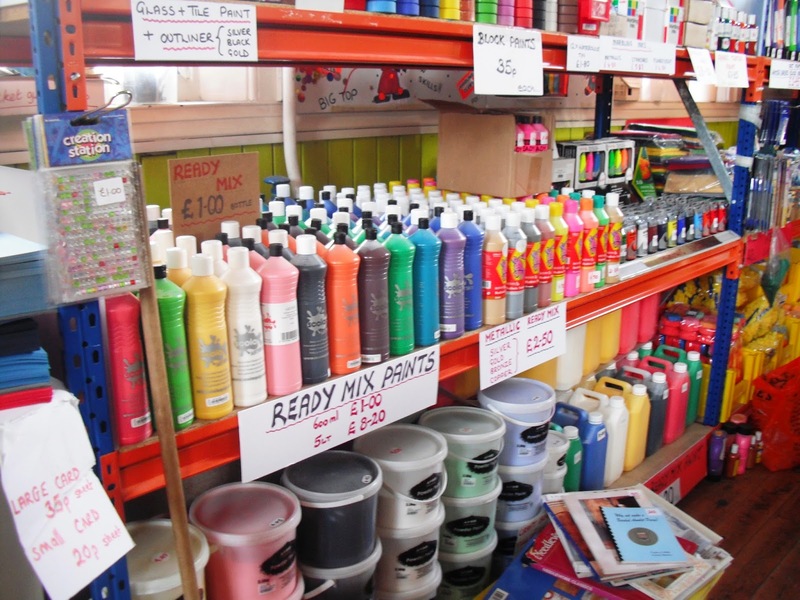 Lots of paint for children's activity classes. Coloured card and paper. 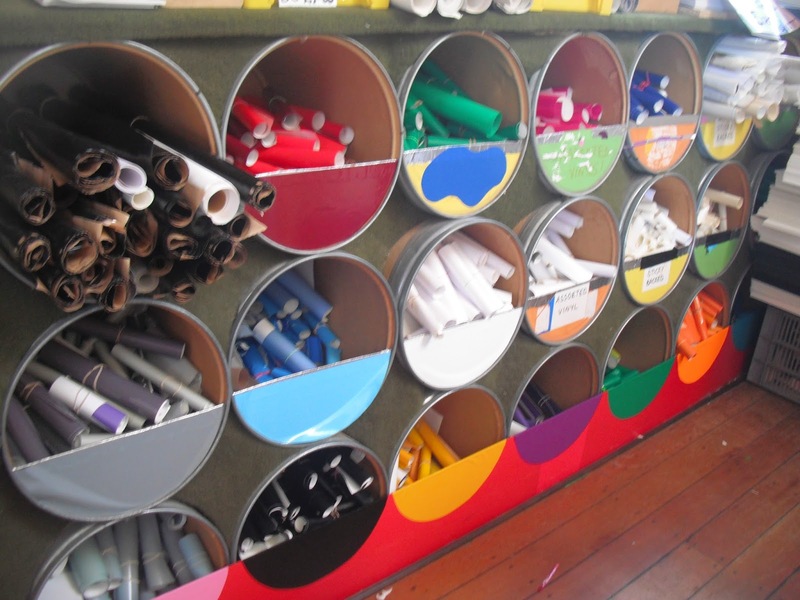 General stationary. 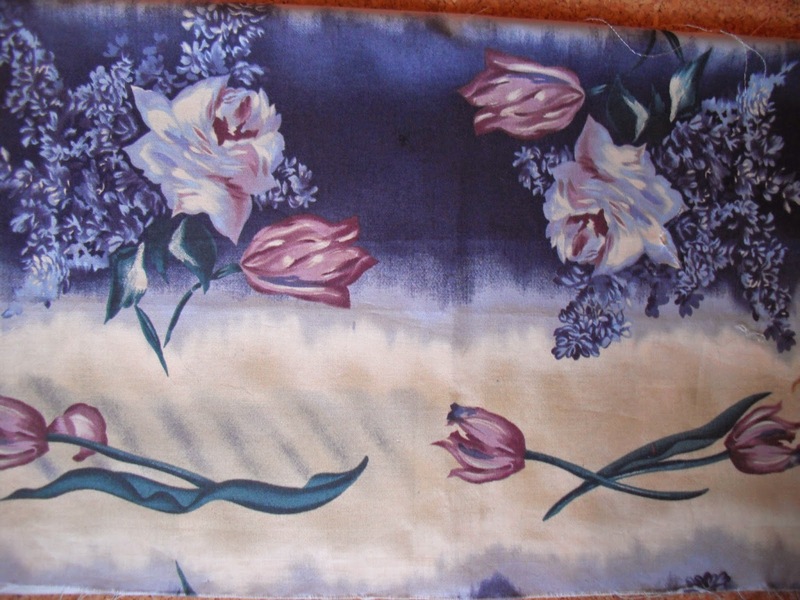 Ribbon sold by the metre. 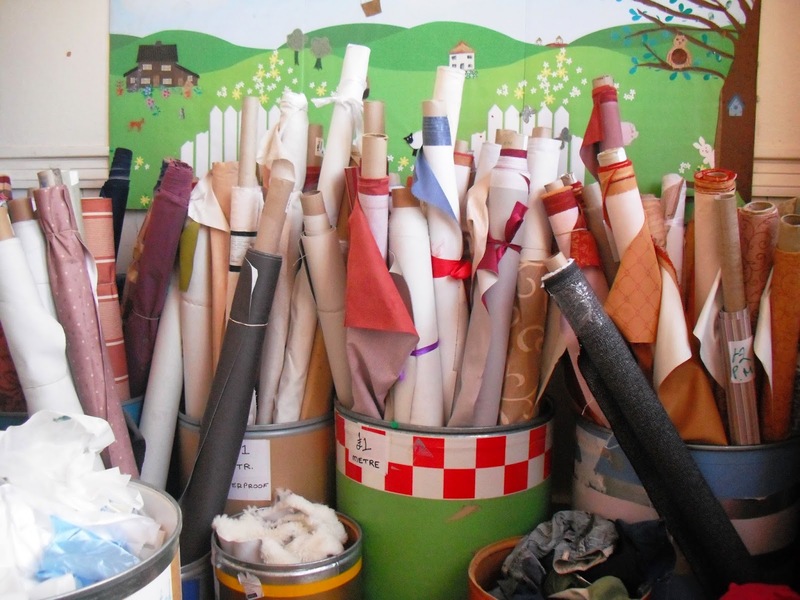 A pile of large Roman Blinds, £2 each. 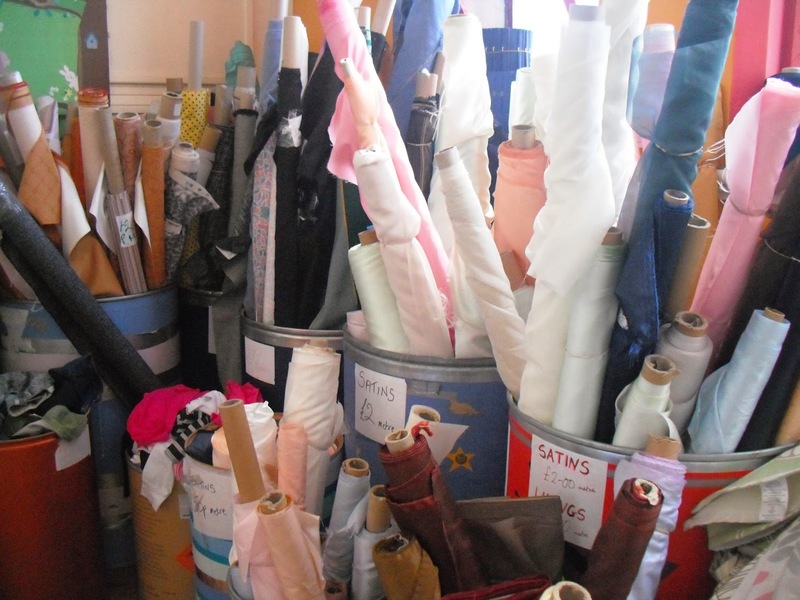 Many different kinds of fabric, if it's on a roll it's sold by the metre. Smaller pieces add them to your basket. There are some gems if you rummage to the bottom of the pile. 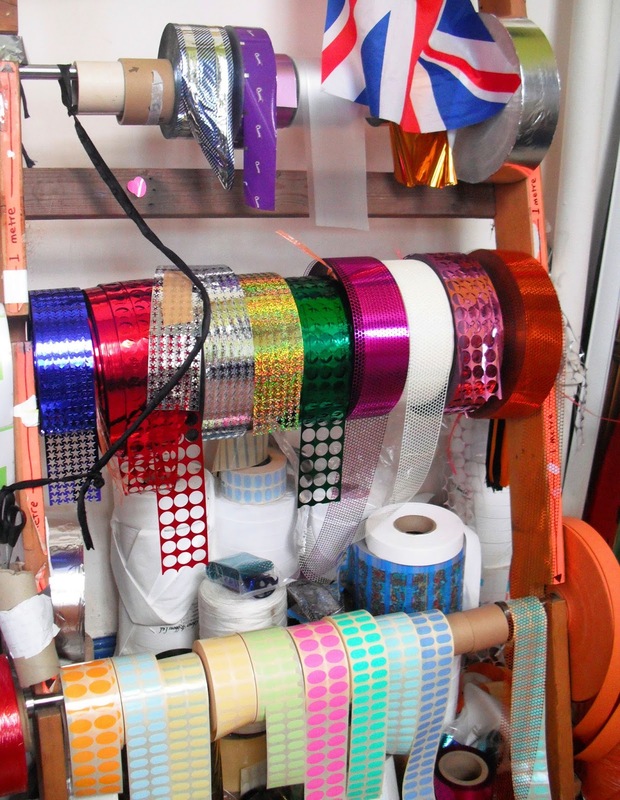 Sticky labels and foil strips. 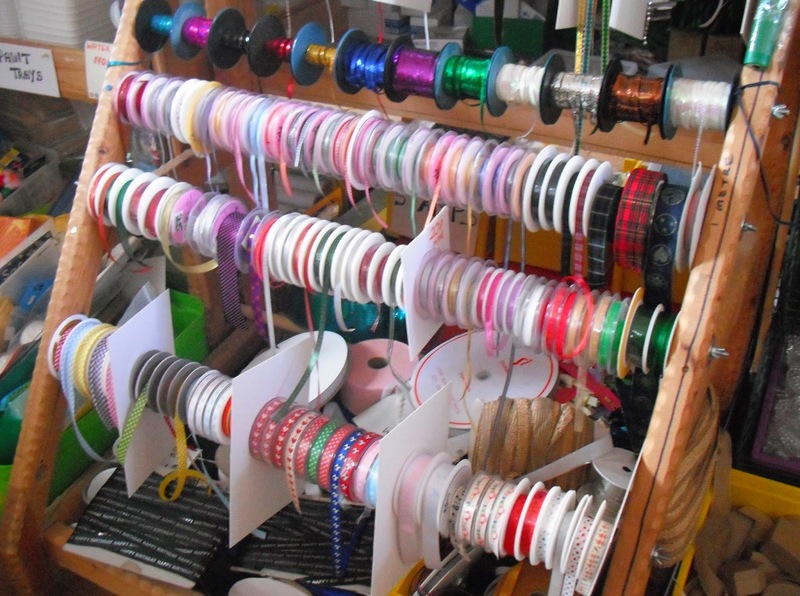 Lots of ribbon and more fabric. This is Tracey with her volunteer assistant. She is employed part time to drive the van, just back from collecting, now unloading more stock. We all filled a basket, the other ladies were very pleased with what they chose. 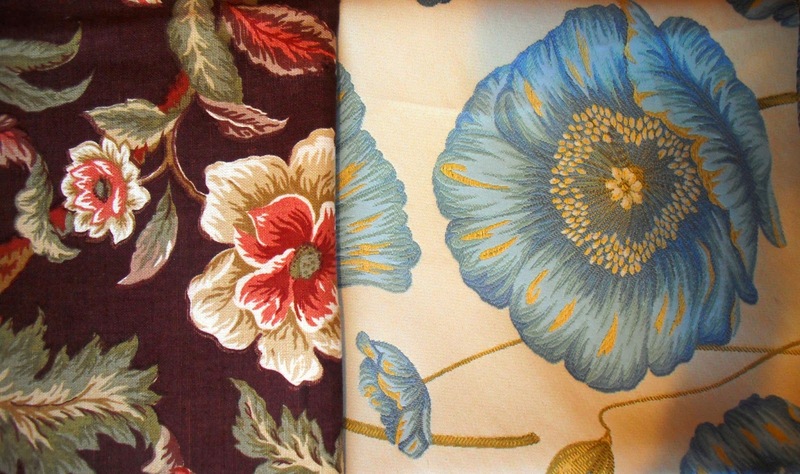 Here are a few items which I chose, different size pieces. Some are big enough to make bags with, but I will choose small pieces if I like the design. 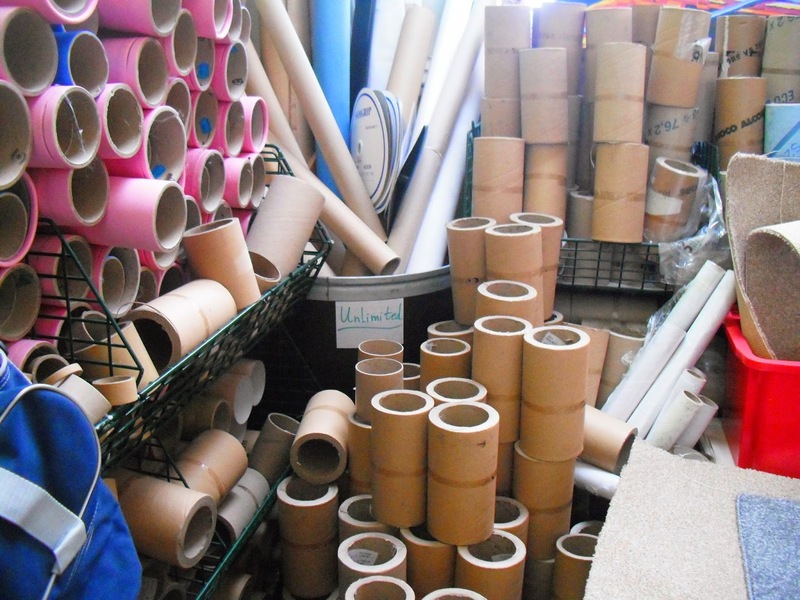 Hull Scrapstore has a web site. The National website has a directory if you want to check out whether there is one in your area. 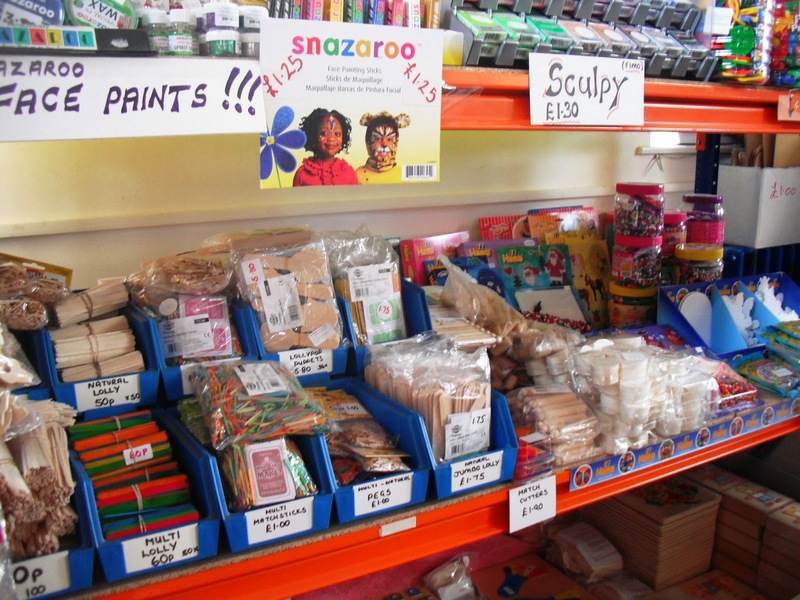 Scrapstores are inspiring places, people are passionate about keeping unwanted stuff out of landfill. I think there should be one in every town. Councils should be providing free or low rent buildings for this, they would save thousands if they encouraged everyone to recycle, reduce their waste, and re use existing unwanted materials. Thanks very much for popping in. 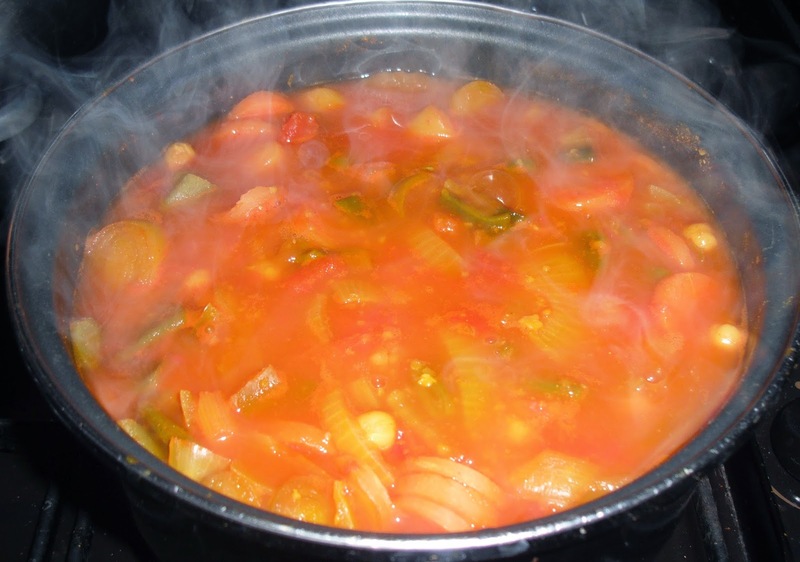 What's bubbling in the cauldron tonight? Hello. Sunny and cold here today. but snug and warm in the Village Hall this morning for the craft club. Everyone was in a jolly mood. 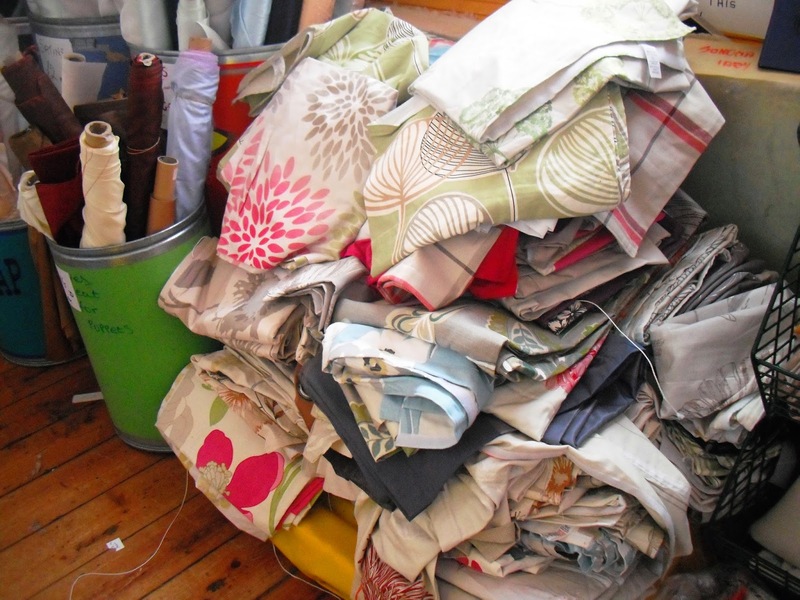 Arrangements have been made, four of us will be off to Hull Scrapstore in the morning, two of the ladies haven't been before, and I want to have a nosy to see if there is anything new in. 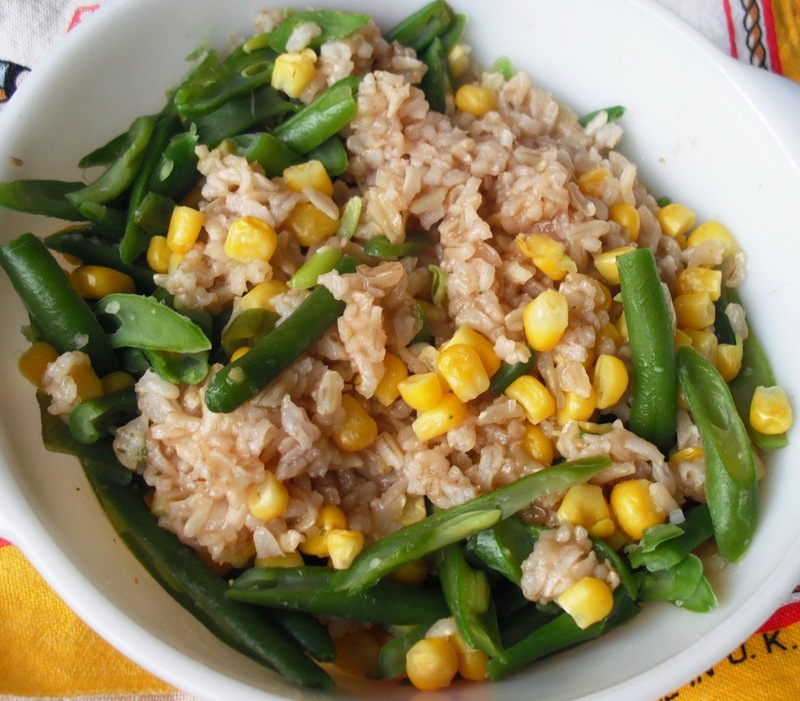 Yesterday's lunch was simple, a pre cooked tub of brown rice, zapped in the microwave with a teaspoon of gravy granules, Frozen shop bought sweetcorn and green beans, boiled for three minutes in a pan, mix it all together, and eat. 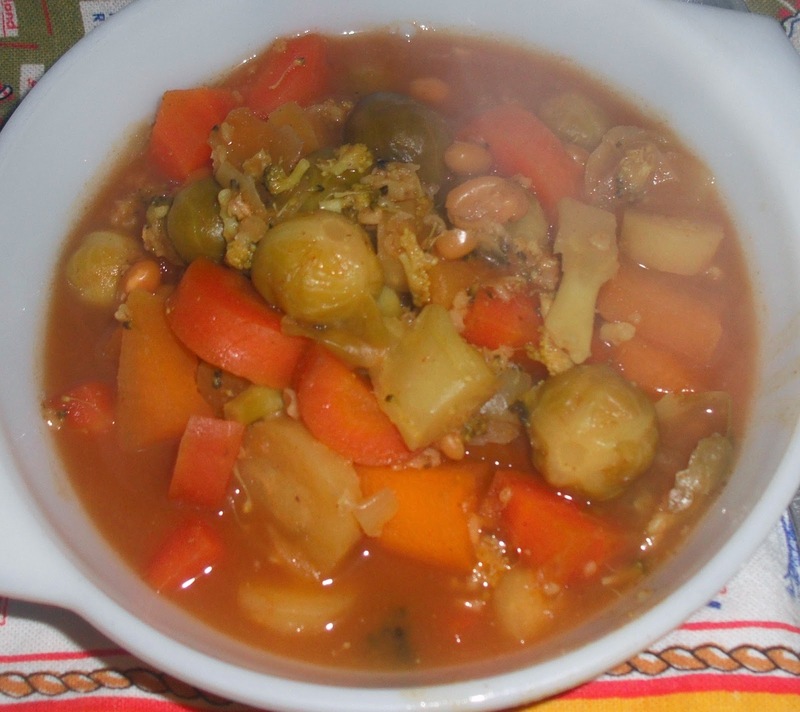 Last night it was veg stew, which I finished off today at lunchtime. 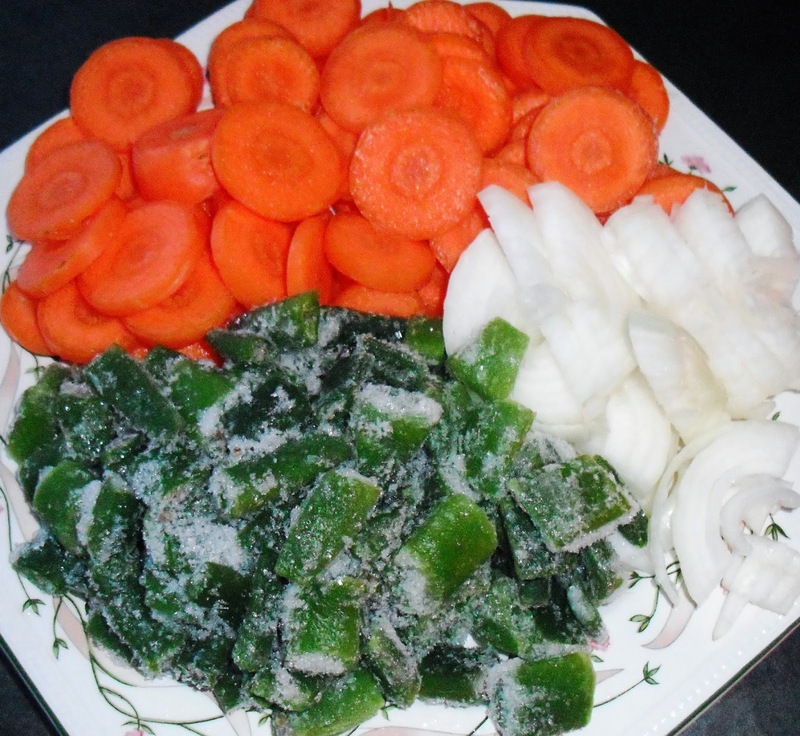 I was going to spin it out by adding more ingredients, but thought, no make a fresh one for tonight. Here we have three carrots, one onion, and the last of the home grown runner beans. 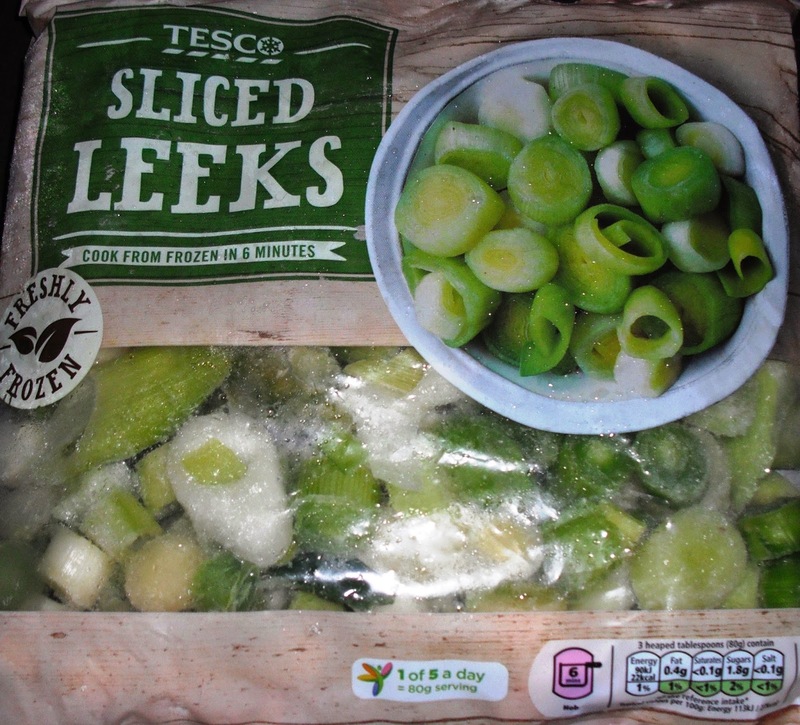 Chuck in three handfuls of frozen leeks, £1 a bag from Tesco. 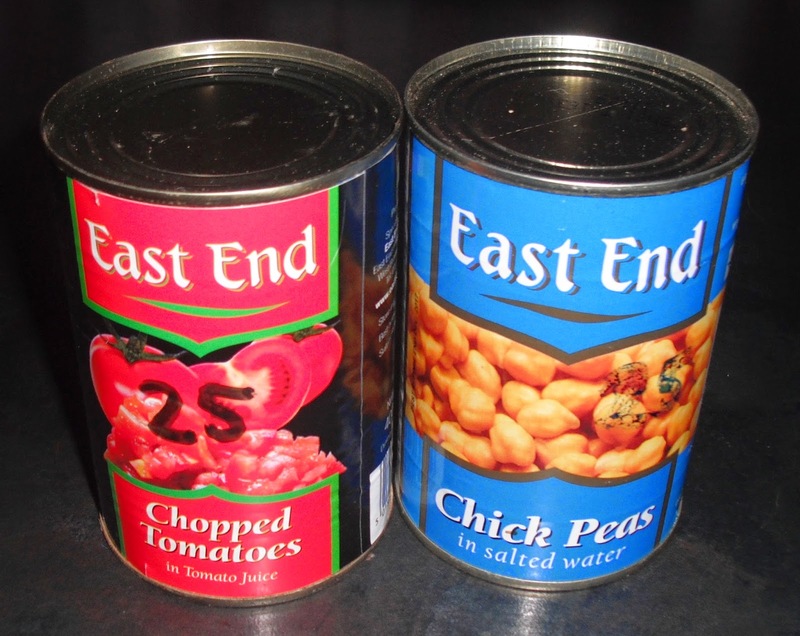 Add a tin of chopped toms and a tin of chick peas, 25p each, Tesco special offer, 4 for £1. Spices were then added to the mix. And there you have it, bubbling away, smelling divine. Two spoons of plain yogurt and some grated cheese was the icing on the cake. Four portions which will be eaten over the next three days. I zapped it with the stick blender because I'm too lazy to chew it, ha ha. It was so good I had seconds. I love this cooking four meals in one pan lark, got to be cheaper on the fuel bill. Short post tonight. I'm going to watch Mr Selfridge before I retire to bed. Catch you tomorrow. Guten Morgen, and welcome to the wonderful world of Meanqueen. Yes I am mean when it comes to spending. I hang on to my money, save it up, then treat myself to something I really really 'want' after the 'needs' are paid for. If I can get something free, I will, if I can get it cheaper, reduced, bargain price, second hand, then I will. More money saved, the more treats I can have. 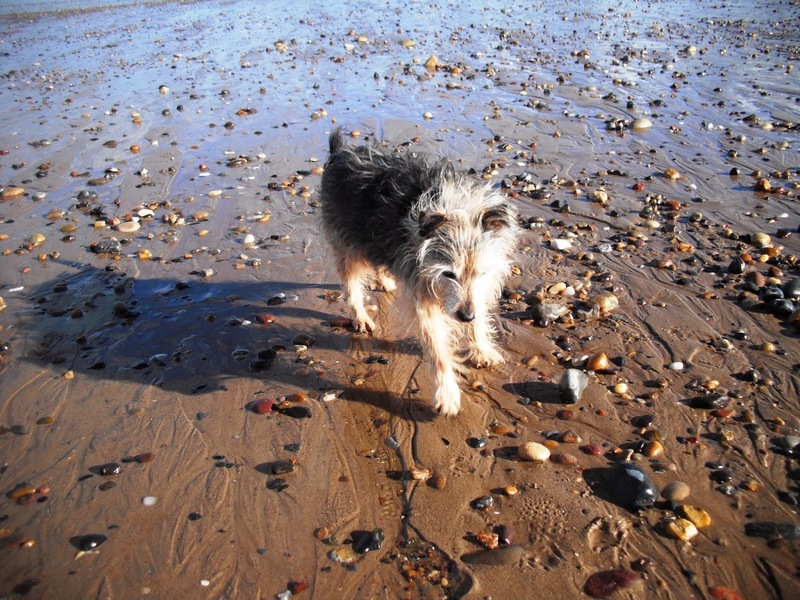 Yesterday was a treat day, a day out at the seaside. First stop was the Tourist Information Centre at the Humber Bridge car park. A very nice lady works in there, called Barbara, and they have tons of free brochures and leaflets. Must gather information for possible days out, places to visit. 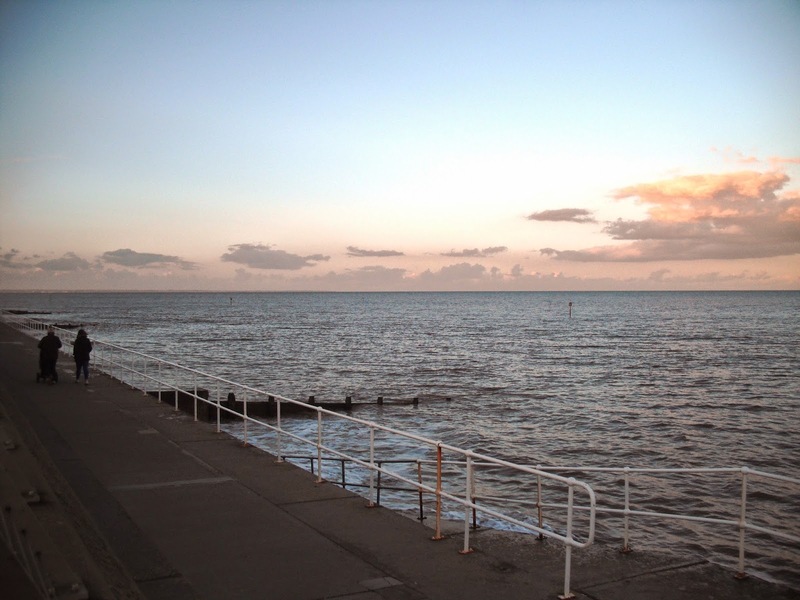 This time me and the little fella went to Hornsea, a small holiday town on the east coast of Yorkshire. The Humber Bridge costs £1.50 each way, total mileage was 75 so petrol to pay for, but my car is high on my list of priorities, it gets me out and about which is good for my soul, and my health and happiness. I wanted to park close to the seafront so chose a car park with a large grass area, plenty of space, ease of getting pushchair and dog out of the car. Cost £3 but better than searching for a space on the side of the road and traffic passing withing a couple of feet while unloading. Another additional cost was two choc chip cookies for £1, from Cooplands the bakers. 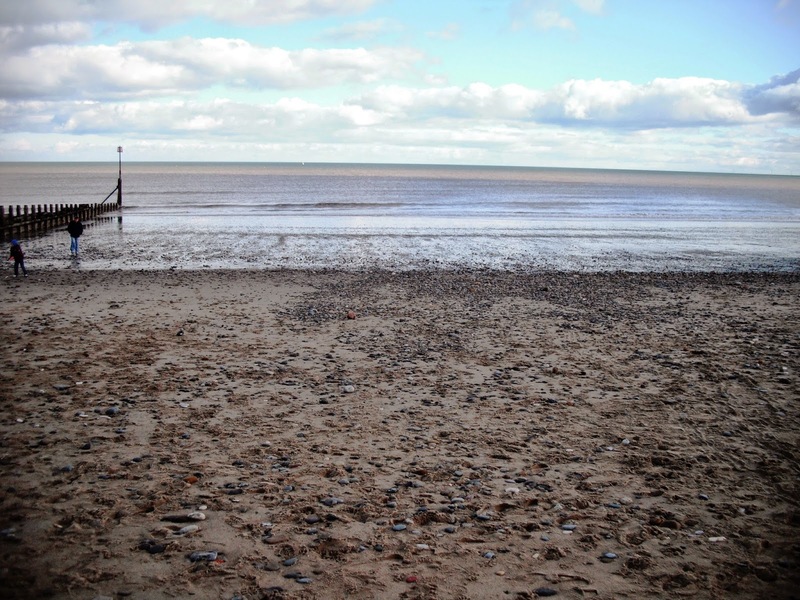 What's Hornsea like then? A mainly sandy beach with quite a lot of pebbles on it. The tide was out but the seashore not too far away, near enough to paddle, we didn't. I dragged the buggy onto the sand, quite difficult, especially after having to negotiate two very steep slopes from the double deck promenade. I don't know how people manage with a wheel chair, virtually impossible I would think. I had to come down the slopes backwards, pushing the buggy down there wouid have resulted in tipping the little fella out. There were kids and dogs, a glorious sunny day, but a bit chilly, I was wrapped up in my skirt and scarf. 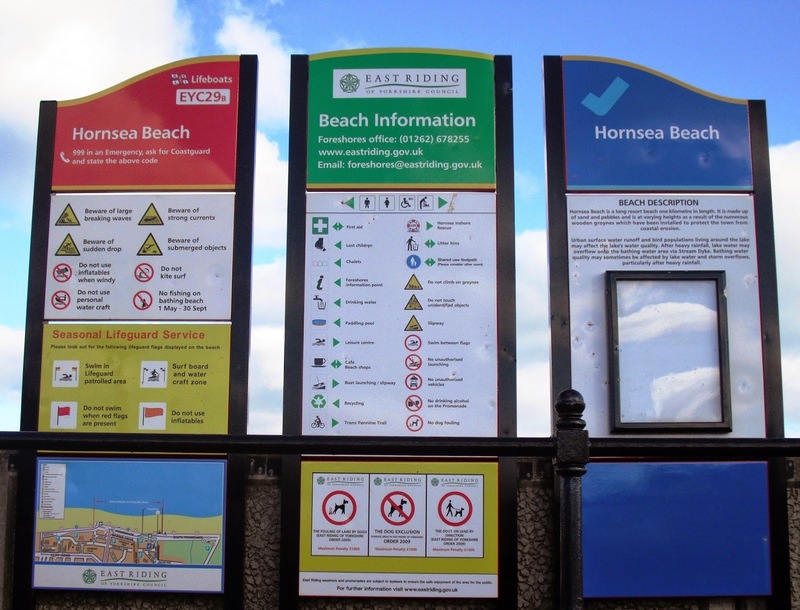 Big notices on the promenade as usual, what you can and can't do. Plenty of rules to keep to. 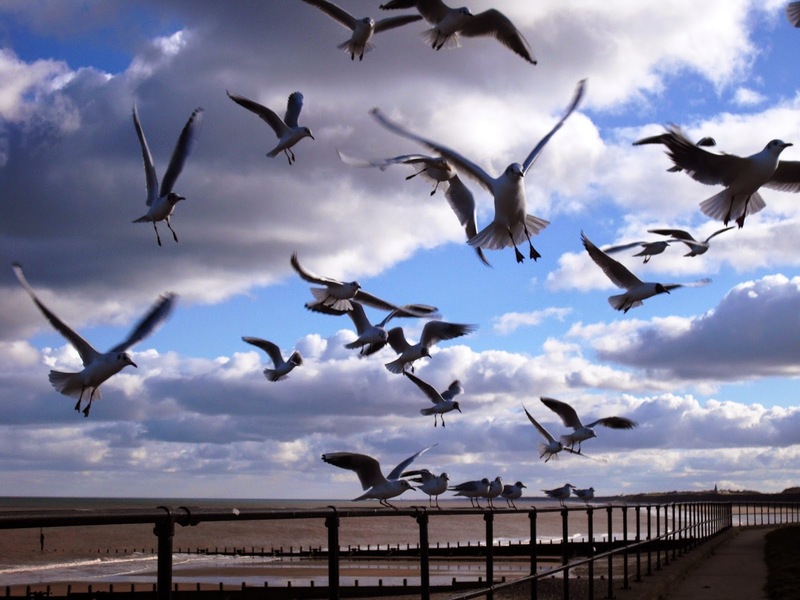 Sorry, I just had to add four pictures of seagulls. I snapped away and picked out what I thought are the best ones. 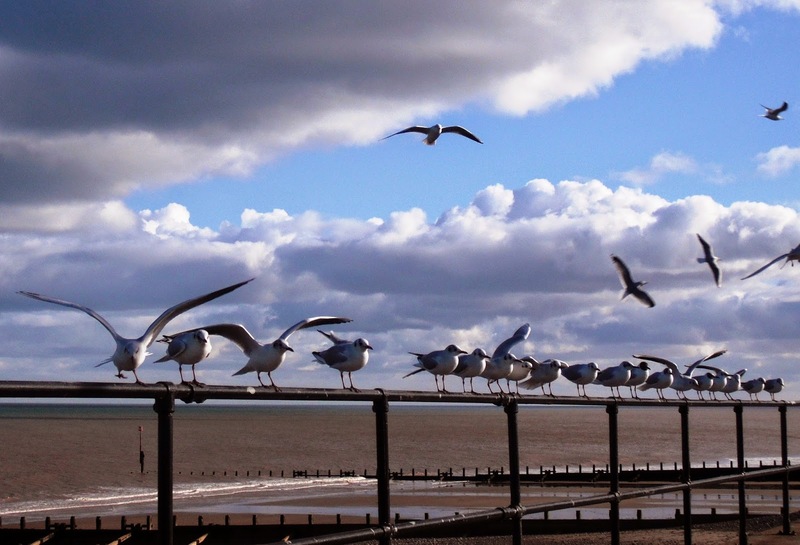 We were walking along towards the caravan park, there were cars on the right hand side, and so many seagulls taking off and landing. Lovely blue skies and fluffy clouds. 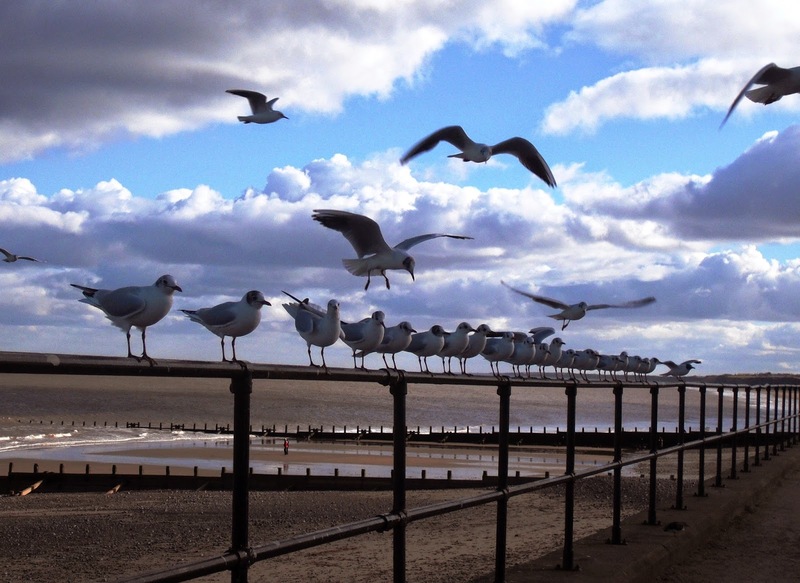 I'm sure I saw Jonathan Livingston Seagull amongst them. As I started walking again I noticed that in one of the parked cars was an elderly couple who had been feeding them. 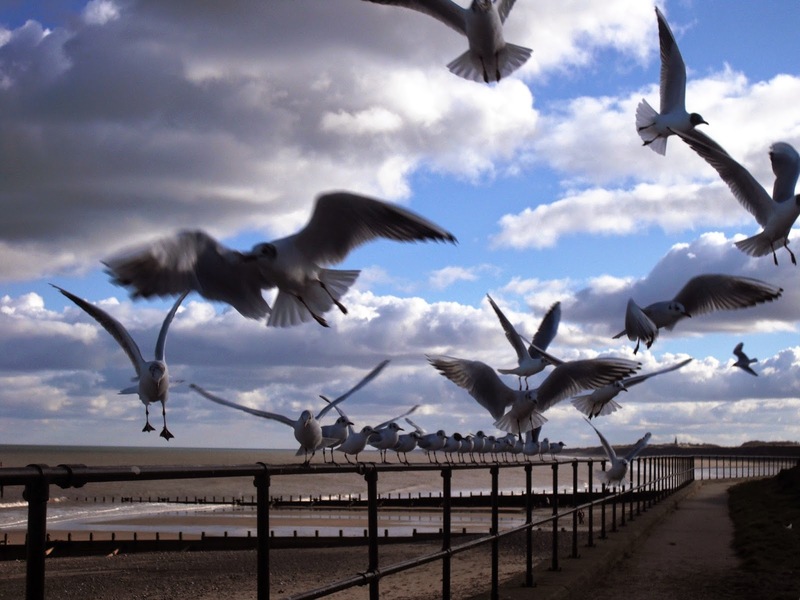 They spotted Rocky and smiled so I went over to them to say thank you for encouraging the seagulls to land so I could get the photo's. They were so sweet, out for the day from Leven, a small village a few miles away, we had a lovely chat. 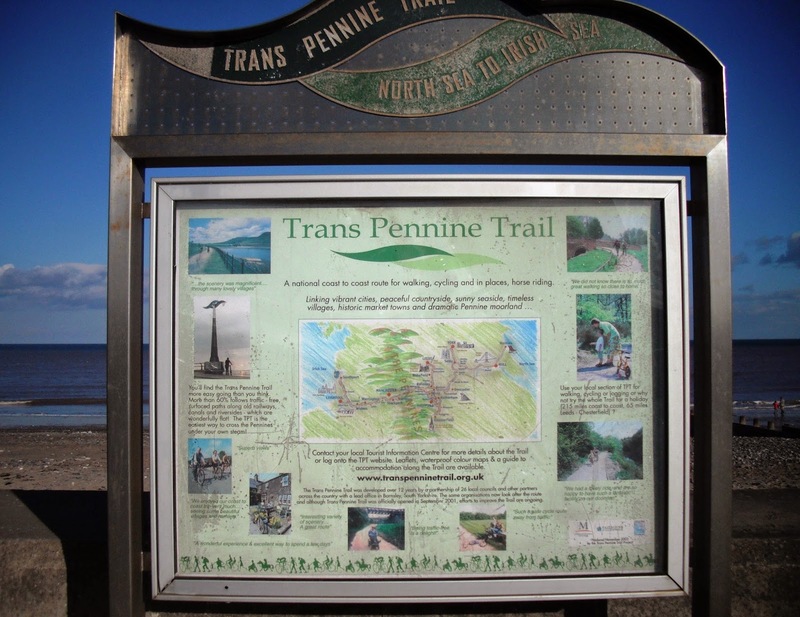 This is the notice which marks the start, or the finish whichever way round you do it, of the Trans Pennine Trail, a long distance cycle route which starts and finishes at Southport on the west coast and Hornsea on the east coast. From the north seat to the Irish sea, or vice versa. Here is a link to the web site. I need to be studying this because I shall be using parts of it on my next walk from Southport to Scunthorpe. 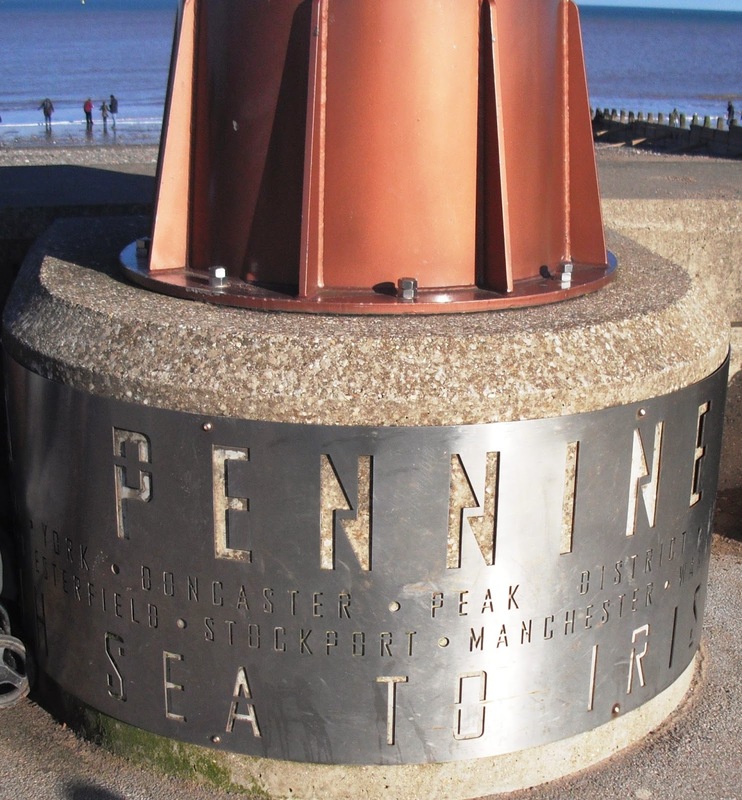 There is a very tall monument next to the sign, with an outline of the route cut into the stainless steel collar around the bottom of it. The seafront is not very long, there are the usual seaside attractions of rides and slot machine arcades, and as we had a bit of time to spare I walked into the town. 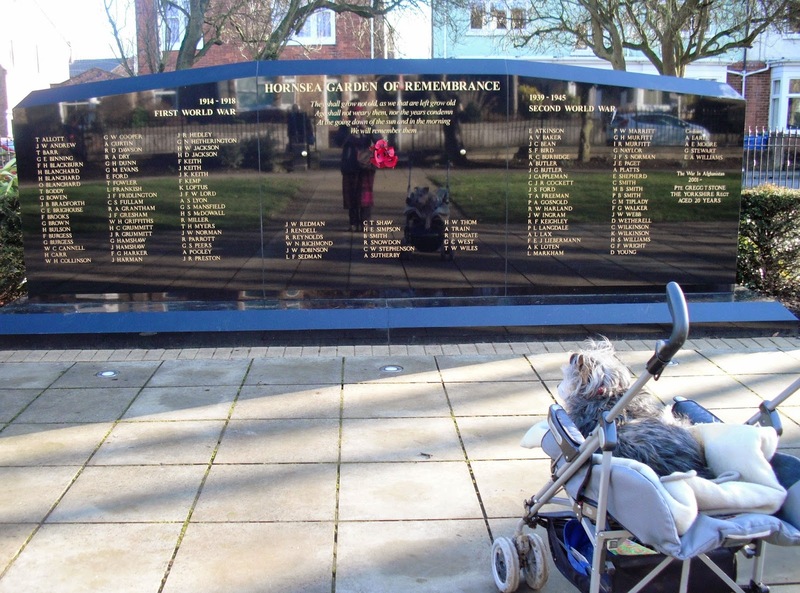 The Memorial Gardens have a huge Remembrance Monument in the centre. It looks very grand. Polished black marble, can you see our reflections. This corner building caught my eye. 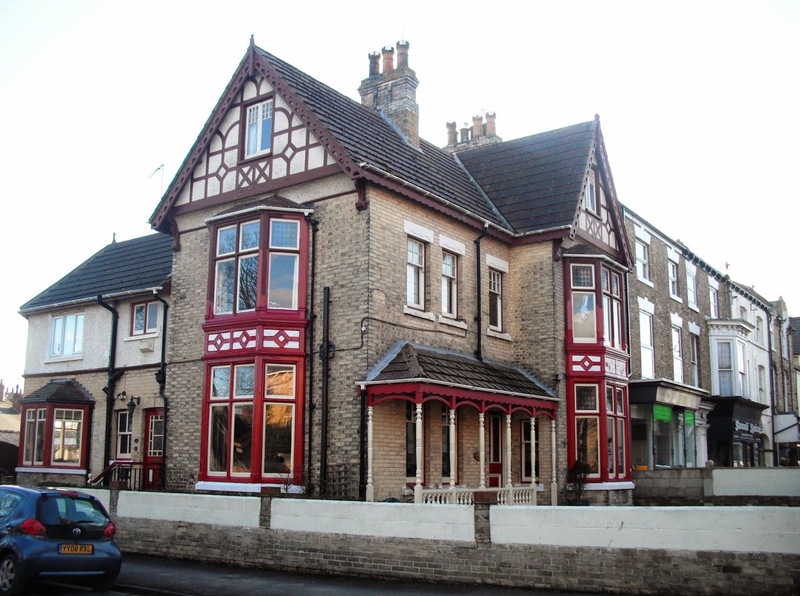 I love the veranda on the front, and the colours of red and white bring it to life. 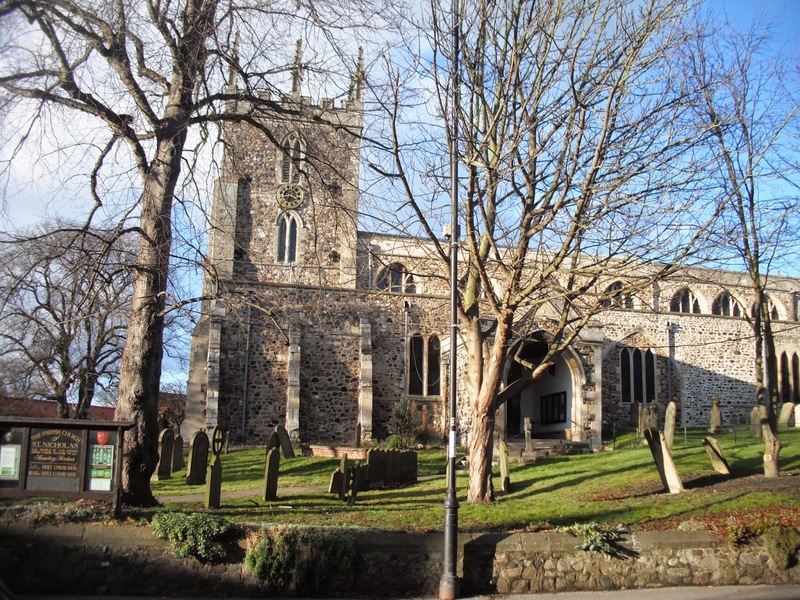 Glorious sunshine today, we are lucky with the weather. 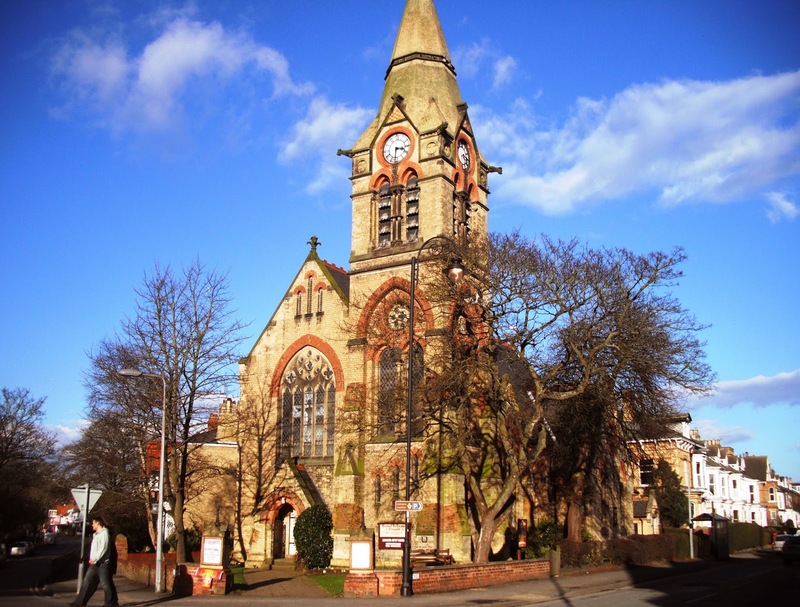 St Nicholas Church stands tall and proud. Lots of charity shops in Hornsea, which I couldn't go in. No no room for buggies and dogs not allowed, and I won't leave him outside. When I bought the cookies I had to park him at the open door so he could see I wasn't too far away. We had a wander through Hall Garth Park, Rocky was ready for a walkabout. 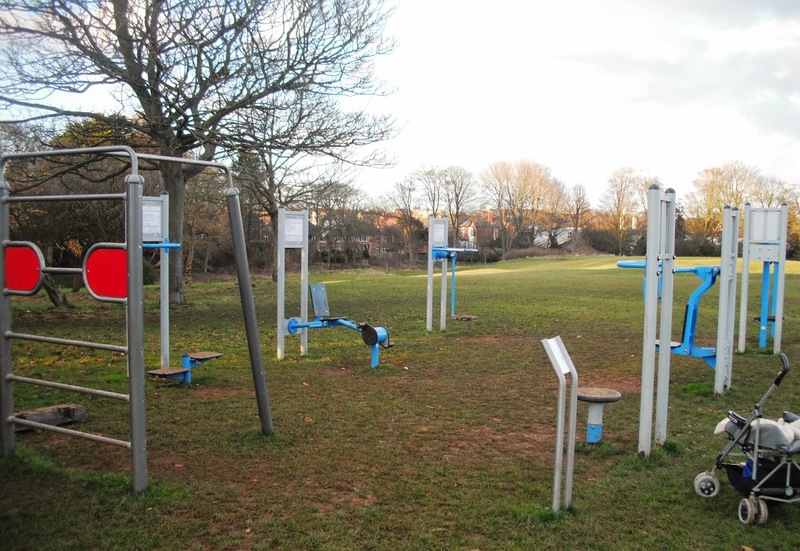 How fabby, they have an outdoor free gym. I wonder if anyone uses it. I had a little play. It's very hard to lift your own body weight with your arms. I managed about six push ups, but the muscles in my shoulders and back are not my strongest. I am more of a leggit girl myself, ha ha. Time to go home. The tide is in, no more sandcastle building today. The sea comes right up to the wall. It was straight home, no stopping. Could have called in at Tesco Barton, they have sent me a £6 off voucher, but couldn't be bothered. Always another day. All cats have been in the house all day, Bugsy snoozing in his usual place in the bedroom. Heidi shut in the spare room separated from Mayze who had the run of the house. Heidi's injuries are not looking too bad, I'll keep her in a little while longer, she wants to go out, but mum says no, ha ha. Hello. This is a catch up post, wot I've been doing for the last couple of days. Pretty mundane stuff actually but I'll try and liven it up a bit, don't want you falling asleep. First off, look what I found. 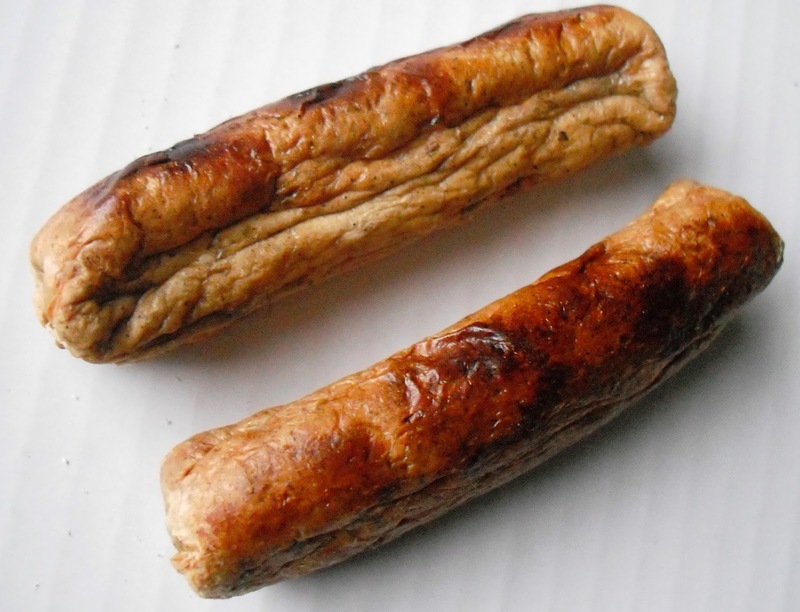 two wrinkly and charred Quorn sausages. They were on the grill pan as I pulled it out to cook some chicken for the cats yesterday. I vaguely remember putting them in there to have with my veggies, must have forgotten them. Possibly a couple of days ago, I think. So what to do with them, eat them of course, don't look too appetizing though. Not to worry, find something to go with them. A portion of brown rice. 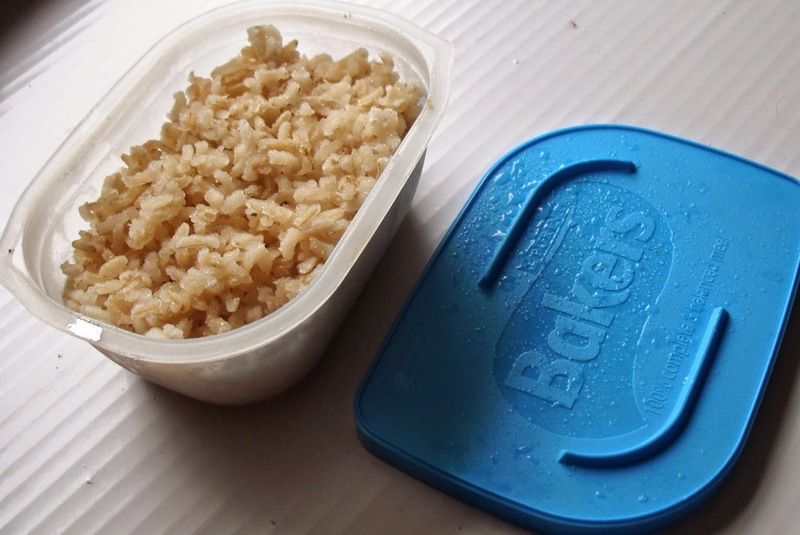 Has anyone noticed these new dinky plastic pots with a blue lid, they come with Bakers dog food in them? Perfect size for a single portion of anything, great for the freezer. So, put rice in a pyrex dish, add a drop of water and a teaspoon of gravy granules. Chop the sausages up in small pieces, I use a big pair of scissors for this, and microwave the lot. Open door and stir a couple of times, make sure it's all piping hot. 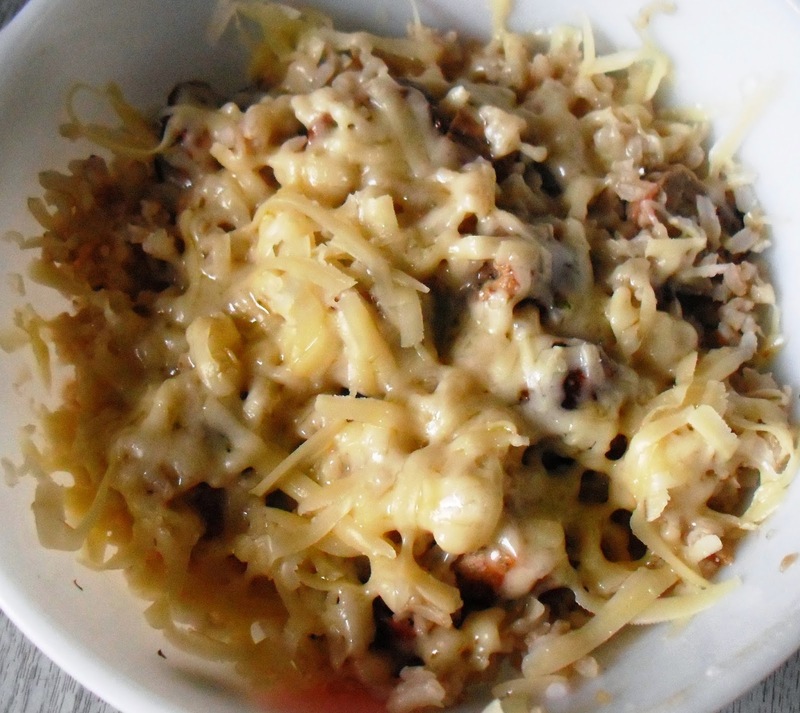 Add a sprinkle of grated cheese. It was bloomin lovely. 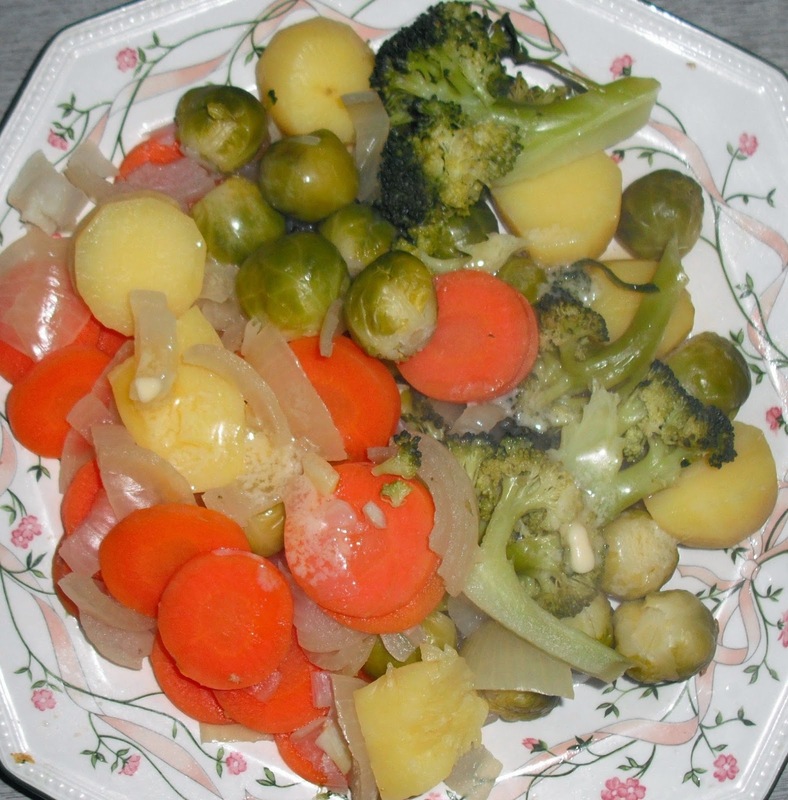 Last nights dinner, a plate of steamed veggies. I know, I'm always going on about this, but look at those scrumptious sprouts, such lipsmackin flavour. I went to town yesterday to pay a bill, and to pick up a few bits and bobs. 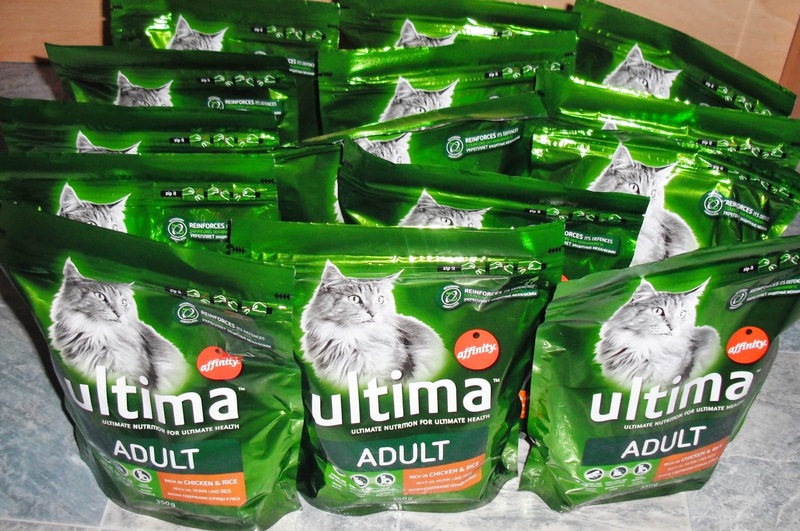 I ended up with sixteen bags of this cat food, found in the £1 shop. This is a good price, normally £1.49 in other stores, so I emptied the shelf. Get it while it's there. My cats love this, they get ever so annoyed if I run out. Already opened two bags, one for Bugsy upstairs and one for Mayze and Heidi in the kitchen. It's in Poundland by the way, if anyone wants to buy it, though sometimes they run out, probably because other people raid the shelf as well. 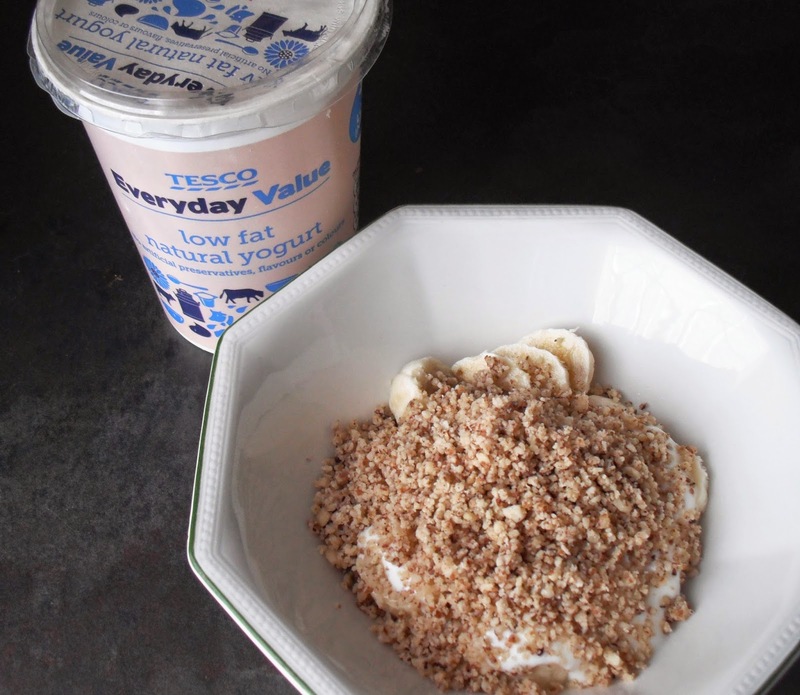 Elevenses today was a banana, plain yogurt, and chopped nuts. Someone mentioned that they get the same yogurt as I do, that particular photo was Aldiddlys yogurt. Tesco's is the same price, 45p, so I get it at either store, where ever I happen to be. 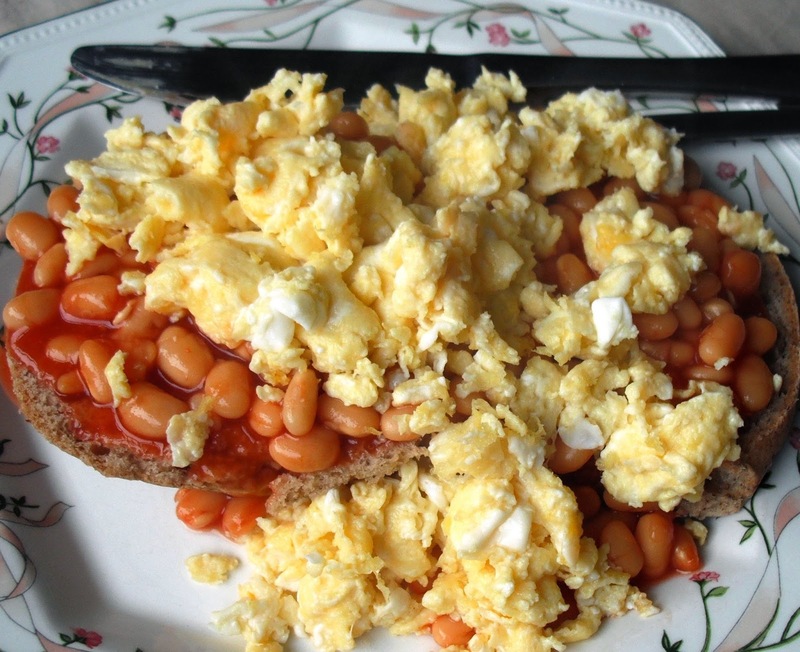 Lunch today was nothing exciting, baked beans and scrambled egg, but I fancied it. I didn't bother to toast the bread, couldn't be bothered.. This bread was a gluten free bun, I bought a couple of packets a few weeks ago on a yellow sticker. Made a sandwich with it for a pack up and it was horrible, tasteless, dry, and gritty like sand, so I'm using it up with beans or spaghetti to give it a bit of moisture and flavour. I opened my bottle of beer today, bought it two months ago. I like this stuff, puts hairs on your chest, ha ha. I haven't had any for a long time, makes a nice change. I put some beer in the pan of stew I made tonight. In here are the last of the sprouts, remember the three bags I bought for 10p each? Two weeks out of date, nothing wrong with them, everything gets eaten here. What else have I done today, ah yes, dug out the compost heap and spread it around on the raised beds. Trimmed a hedge on the back garden and topped the wheelie bin up with the cuttings, it's now ready for collection. 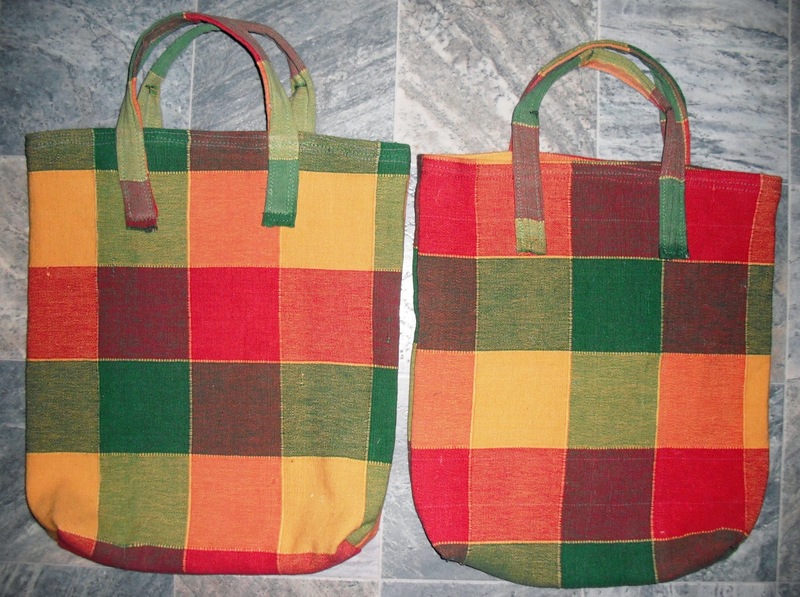 Oh, and made these two bags out of two cushion covers I got out of a skip. 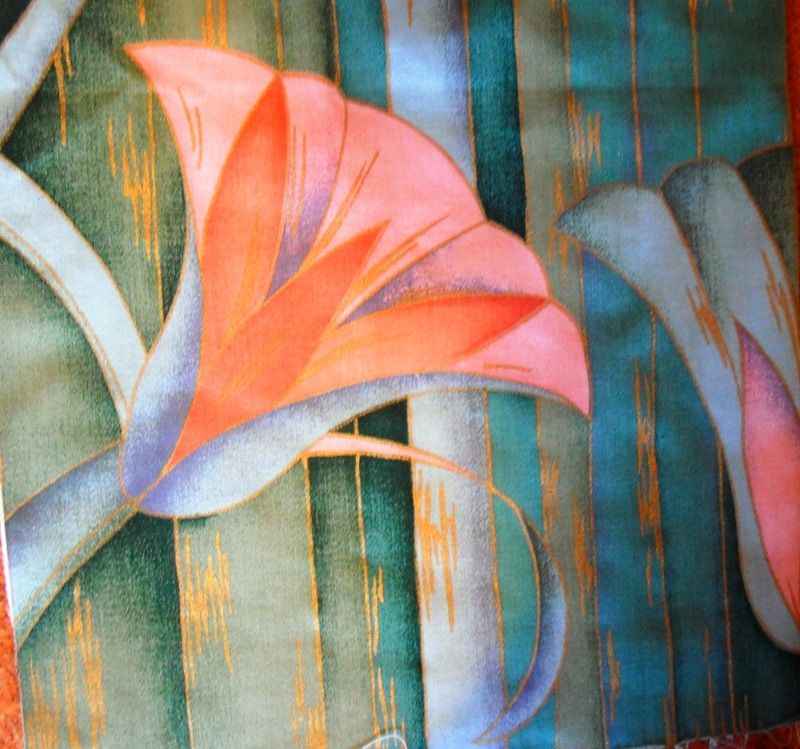 The fabric is quite thick but the colours have faded, so after washing them I unpicked the seams and turned the inside to the outside if you see what I mean. They are not great, but at least they will be useful as bags even though their cushion days are over. Not worth posting them off, I'll pass them on to someone at the supermarket. 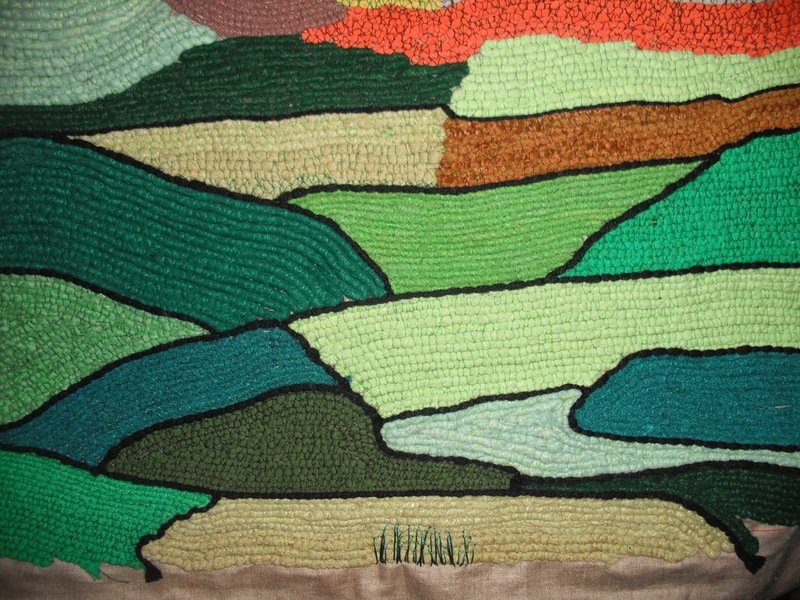 I spent some time working on the picture, have started to add the field boundaries in black wool. Still a long way to go, but I am getting a better idea in my mind now as to how I want it to look. That's about up to date now. Thank you for popping in. The weekend is here again, I wish someone would stop the clock, my life is going too chuffin fast, at this rate I'm going to run out of time. Have a great weekend. Sentenced to Hell, by Natalie Welsh. Book review. Shopping bags and food - what else is there.